This one…I found this one at a flea market, of all places. It was just sitting there, all dusty, at the back of this little old lady’s booth. 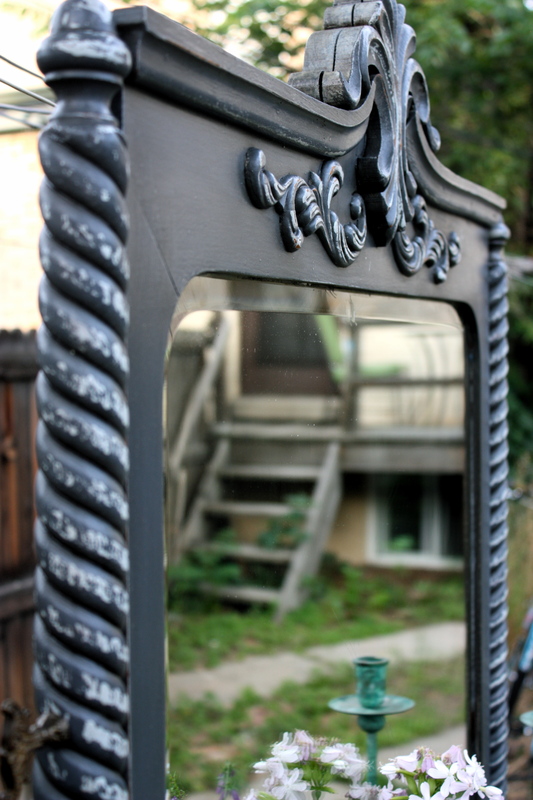 The mirror was just casually laid across the top, rather than attached upright, showing off it’s beauty…no doubt because the lady was missing the bolts. It looked frumpy. And really heavy. Which is probably why it was still available 3 hours after the market opened (I was late that day!). As you can imagine, I jumped all over it…that is, I negotiated like an expert and got it for an even better deal than it already was. Sadly, in my immense excitement to help this classic piece become a modern masterpiece, I totally forgot to snap some before pictures. You can get an idea of what it looked like before, though, because I totally wasn’t about to paint over the beautiful veneered drawer fronts. If you look closely, you can see that this piece wasn’t in the greatest of shape before I bought it. It appeared to have been exposed to a good bit of water at some point and the veneer was chipped off in many places and cracking/bubbling in others. After gluing down what I could, I simply left the rest as is and unfilled because I love the way milk paint settles into the recesses and distresses easily off the edges. Gives it more character! 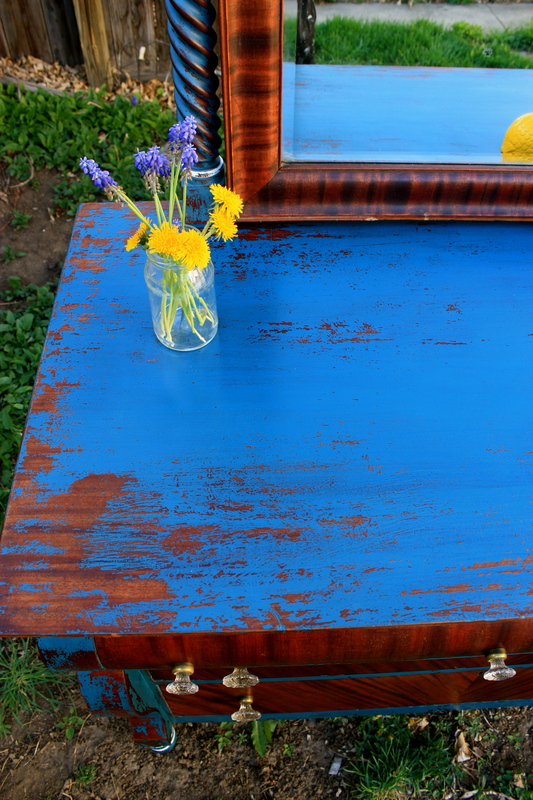 I used Miss Mustard Seed’s line of milk paint for this piece and, instead of making a custom color like I normally do, I stuck with one of her recipes: flow blue. I used the same color on The Appolonia last summer and hadn’t used it since, but I knew this was the perfect piece for it. 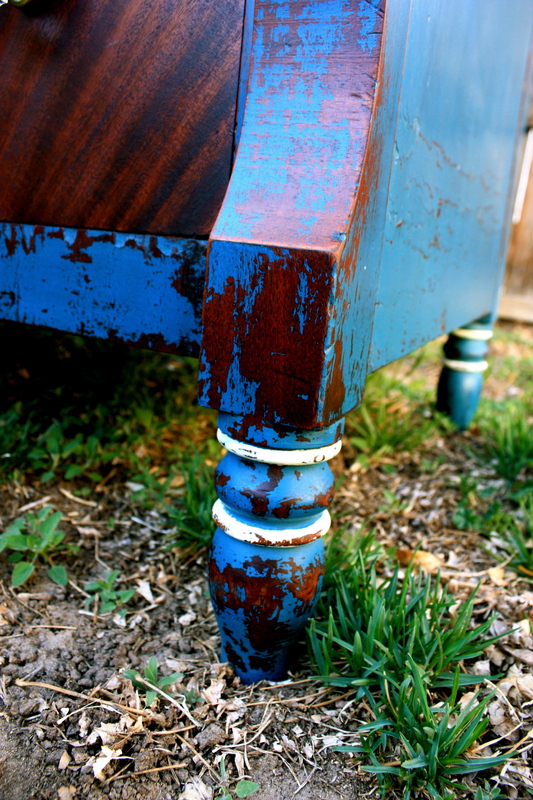 I just love the way that this more royal-ish blue color complements and contrasts with the red tones of the natural wood. Flow Blue and the red hues of the wood really complement each other. Look at those gorgeous red-hued veneers! These crystal knobs are original to the piece! The mirror posts are so beautifully detailed. A close-up look at the detailed post. And look at all that wonderful chippyness! 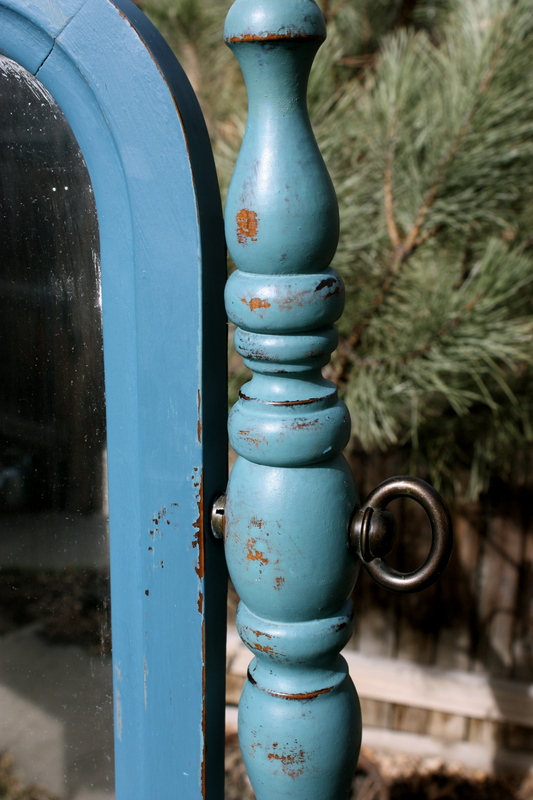 This is one of the things I love most about milk paint…you really never know how much is going to chip away and give that authentic looking chipped paint appearance. The empire posts and the top really chipped and chipped and chipped! Just look at all of the chipping! I’m in love. So in love. This is a piece I wouldn’t mind completely redesigning my bedroom around. But as luck would have it for its wonderful future owner, I don’t have the time or space to do so, haha. Therefore, it’s up for sale in my Etsy shop! And for a limited time, I’m offering 10% off everything in the shop so go check it out. Whoa, holy neglecting the blog for months, Batman! I didn’t realize it had been so long since I posted over here. I’ve been meaning to for weeks. Truth is, there is a LOT going on with Urban DEN right now that is all extremely exciting, extremely terrifying, extremely time-consuming, extremely stressful, and extremely worth it! When I started this little business a couple of years ago, it was nothing more than a stress-relieving creative outlet that brought in a little extra cash. I had no idea how successful it would be, and frankly, successful wasn’t the goal. 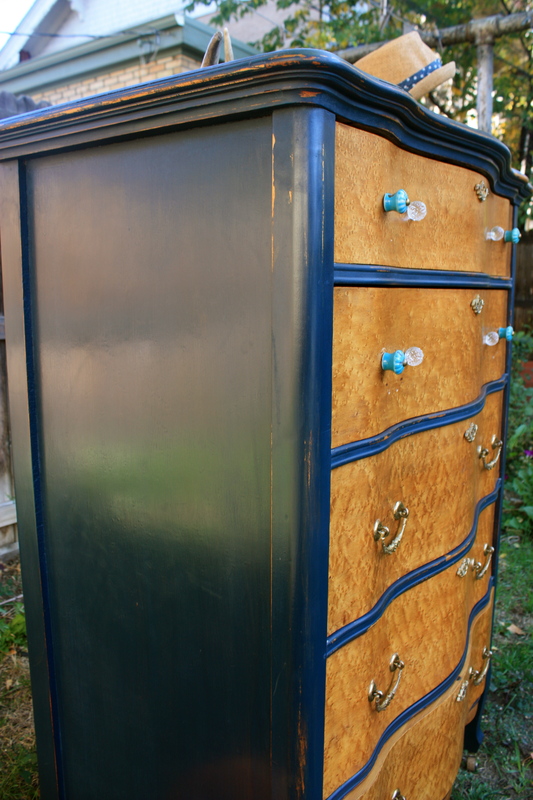 I never imagined that I would fall in love, so much, with redesigning, upcycling, and modernizing antique furniture that had seen better days. I also never imagined the immensely positive response to my unique take on color and whimsy that I have received. Because of that, I never imagined Urban DEN, or, RPhD: Renewals by Pelham Hebert Designs, as it was called back then, could ever be more than just a little hobby based out of my garage. Oh, how time changes everything. For many reasons, I have decided to explore options for opening up an actual brick and mortar store front somewhere in central Denver. While a store-front is at least 6 months down the road, the decision made me rethink my business strategy and marketing for this upcoming summer. While I used to be content just selling out of my garage, online and via word-of-mouth, I decided that that would not suffice this summer if I plan to open an actual store before next summer. Nope. It was time I start looking for ways to increase exposure. 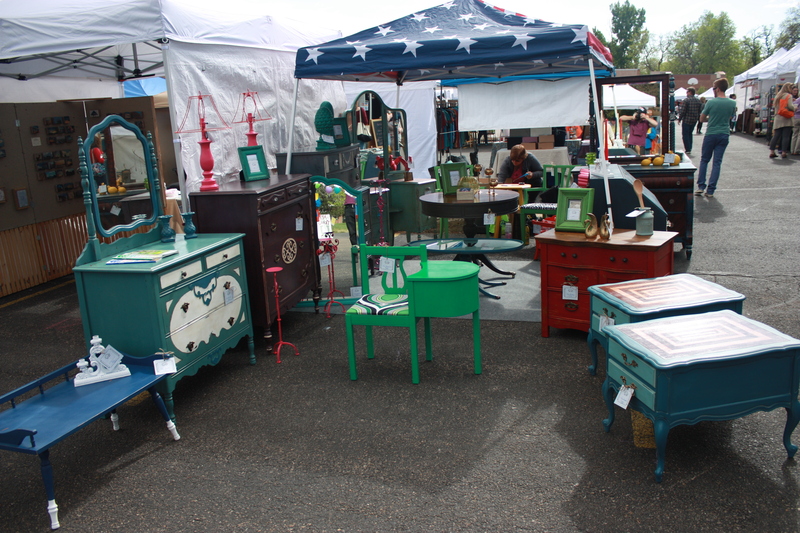 And that is why I haven’t updated the blog in a while…I had to prepare for this summer’s open-air market season. The first market I would be selling at was the Horseshoe Craft & Flea Market’s Spring Market, which was this past Saturday. Due to winter vacations and the really spotty weather we enjoy during the Spring-time in Denver (it snowed 6+ inches the day after the market…thankfully it didn’t happen on market day), time-management became a huge nightmare for me. Also, my inexperience with preparing for something like this resulted in a last-minute rush that I rarely allow myself to fall into. I started my preparations by getting organized. First, I created a “Make-list,” a “Take-list,” and a “Logistics/Price list.” These were the lists of everything I wanted and needed to have in my booth at the market to present a complete image of my brand and to capture as many potential customers as possible, as well as a list detailing everything I needed to do to ensure a smooth day at the market. The “Make-list” listed everything that I wished to create and bring to the market. I prioritized the list by listing the must-haves at the top and included the “only-if-I-have-time” items at the bottom. The “Take-list” listed every item that I needed to bring with in order to have a great booth: canopy, rug, glass-cleaner (for cleaning mirrors), rags, price-tags, business cards, etc. And the “Logistics/Price list” listed everything I needed to do prior to the market…things like creating a new business card, securing my special events sales tax license, and creating a spread sheet for pricing everything I would have for sale. Of course, my “Make List” ended up shooting for the stars (I always do this…I have big dreams!) and as the market approached I realized I was going to have to seriously cut back…both for space reasons at the booth, as well as time-restraints. I still managed to have an overflowing and beautiful booth, but the overachieving “Make List” stressed me out and caused me to essentially work non-stop at the last minute getting everything completed. You live and you learn. And what I learned was that I’m nearly spot on with estimating the amount of time it takes to complete my larger projects…but the smaller projects?? Wayyyy underestimated the time required. But that’s where experience comes in…next time I know. Overall, the market ended up being a great success. I sold a few of my large pieces and a lot of the small pieces and most importantly, I handed out my business cards and met a lot of awesome people. The exposure was my biggest goal with the market and I believe I achieved that. I’ve already taken 2 custom orders from connections made at the market and I hope to receive more in the coming weeks. 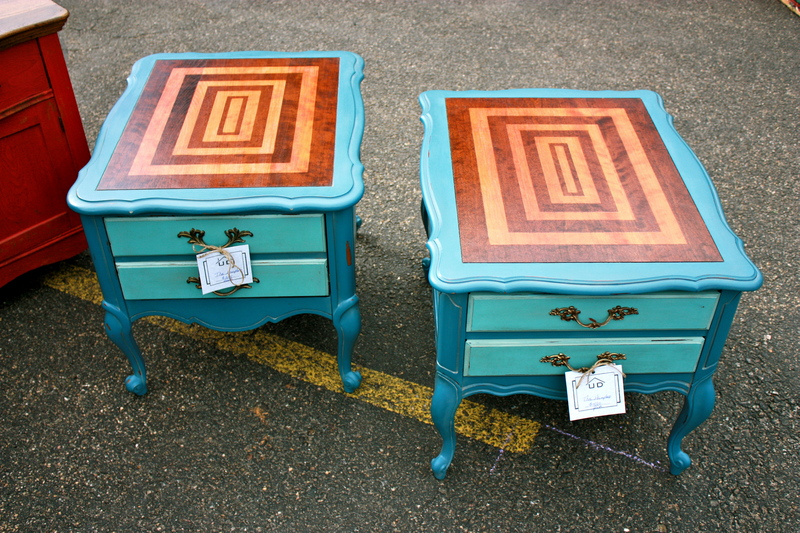 Love these little side tables! I just love that little wash basin! It was very popular amongst the market visitors, too. 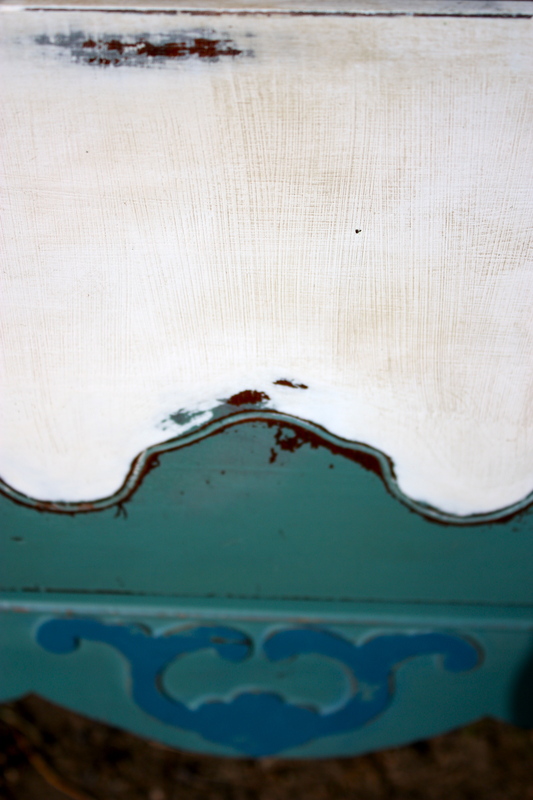 On top of the basin is a great picture frame painted in ASCP Antibes Green…we had a few of them and sold all but one. The cute little jug is a ceramic milk jug that we painted as well…it was one of the first things to sell! This mirror was a huge hit all day. It sold early on but stayed in the booth with a “SOLD” tag on it and many lamented the fact that it was no longer available. In the reflection of the mirror is our wonderful safari themed parlor table, “The Seregenti.” I’ll be making a post for that in the next week or so showing off the transformation. 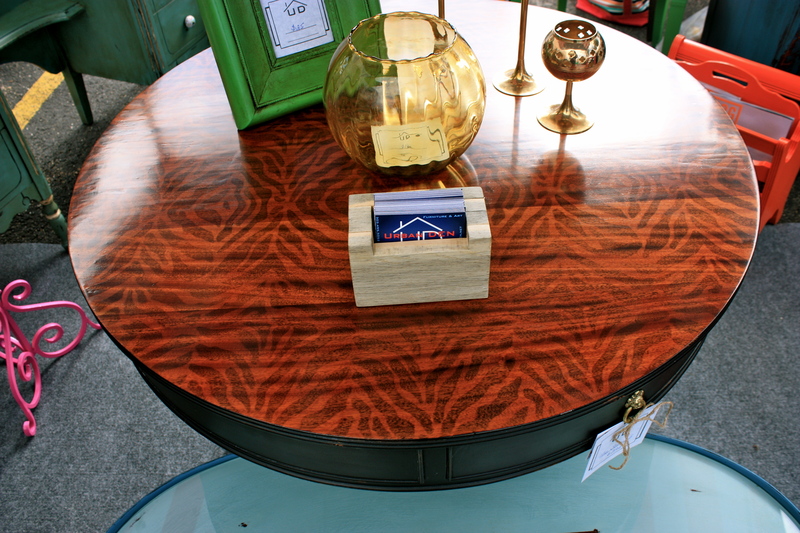 The other table is a cute little Duncan Phyfe style coffee table that still had it’s original glass insert. I painted it in two different colors and stenciled “LOVE” on the top so that people could put photos of what they LOVE most underneath the glass and have a wonderful conversation piece. It also sold pretty quickly to this wonderful and cute elderly couple! Look at our awesome little business card holder! Look at that stunning top! Like I said, more on that later. But look at the awesome little card stand that I made out of beetle-kill pine…I just love the blue that the pine beetle leaves in the wood after killing the trees. 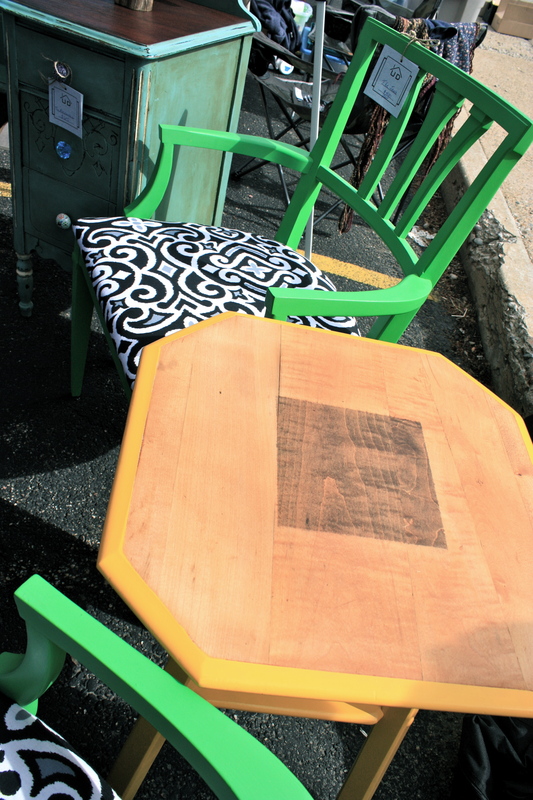 Our pair of vibrant green chairs, The Janis and The Joplin. Isn’t she stunning? She’s still available! She’ll be up in Etsy shop soon. Come back soon, as I’ll be doing my best to post some of the new pieces we made for the market over the next week! A Voyage to the Sea! So it is no secret that I live in Colorado and LOVE winter…okay, maybe it isn’t winter that I love, rather, it is the winter sports that I have fallen so much in love with. Skiing, snowshoeing, tubing, snowball fights, ice skating, etc just thrill me to the bone…not chill me to the bone like many of my friends and family from back home assume. You see, I, like many of my fellow Colorado neighbors, am not a Colorado native. Nope. I moved here 5 years ago from the sunny, humid, tropical island of Key Colony Beach in the Florida Keys. 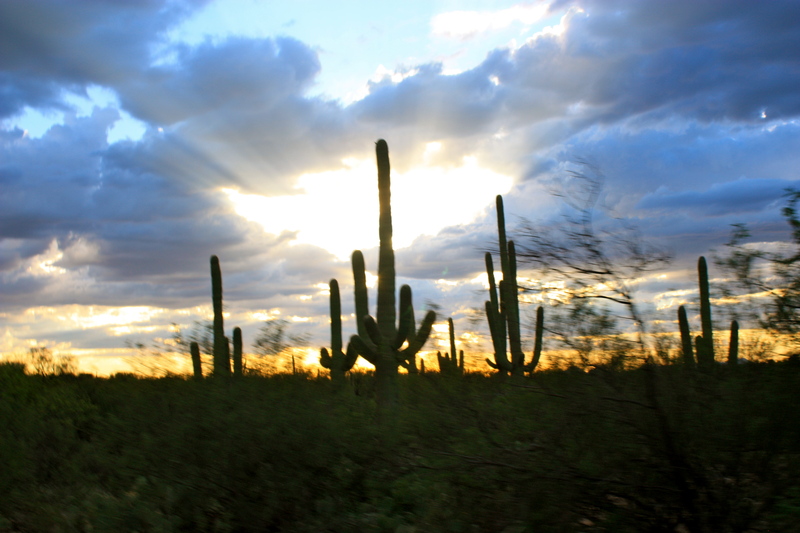 It’s a place that most people consider “paradise!” In many ways, I suppose it is. But for this mountain lover, the only thing I usually miss about back home, is my family. 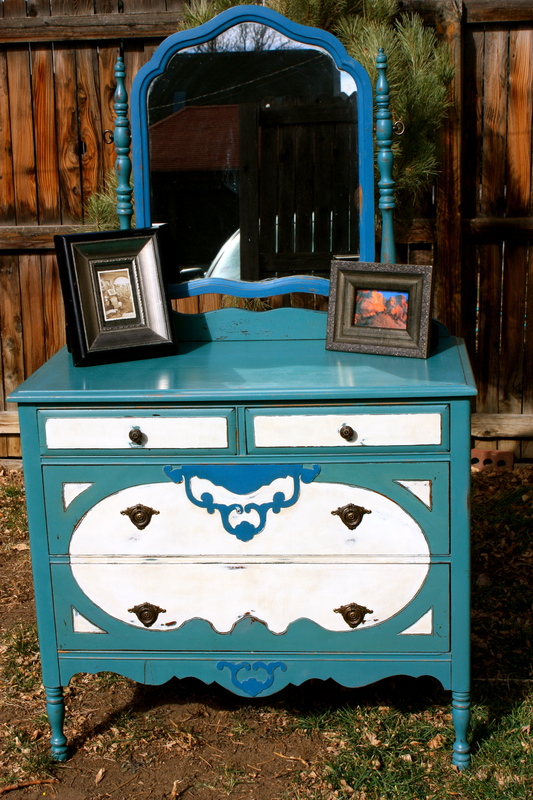 And then one day, while staring at this dresser, I suddenly longed (it’s been a pretty cold winter here in Colorado!) to be sitting on the beach staring off into the brilliant green and blue waters that surround the Keys. It was pretty strange because, although I spent 25 years of my life practically growing up IN the ocean, I rarely ever miss it. And thus, I took it as a sign and found my inspiration for renewing and re-designing The Atlantis! Sadly, in the wake of my shocking revelation, I completely forgot to take a “Before” picture! I guess I was just extremely eager to bring my unexpected vision to life. Anyways…don’t you just love it? The beautiful sea-green color is so much like the waters inshore of the great coral reef in the Florida Keys and the deeper blue accents are like the waters further offshore from the reef. I guess it should be no surprise that my mom, who spends most of her days staring at these waters from her patio, really, really loves this piece! The distressing on this piece is ever so slight and I really love the way the paint seems to have just been weathered away by salt air and wind. 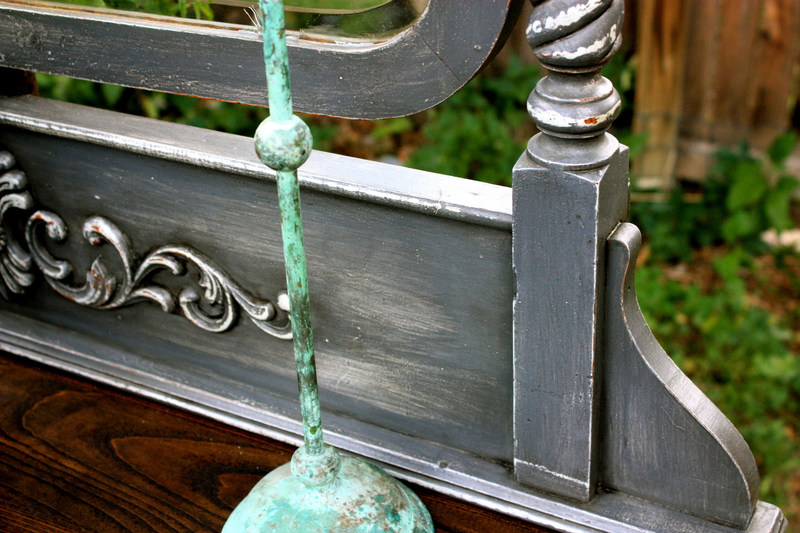 And the original brass cheval mirror pins look so luscious next to these saturated colors…just wonderful! 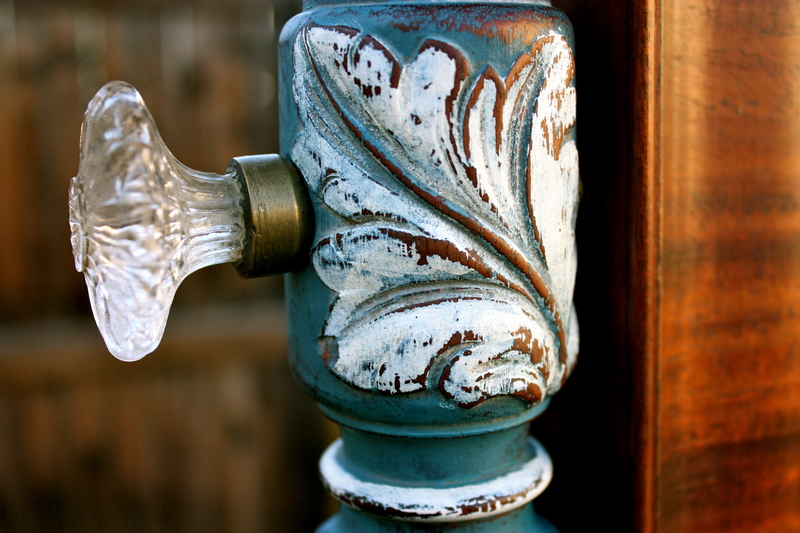 The original brass hardware has the same effect against the white accents. 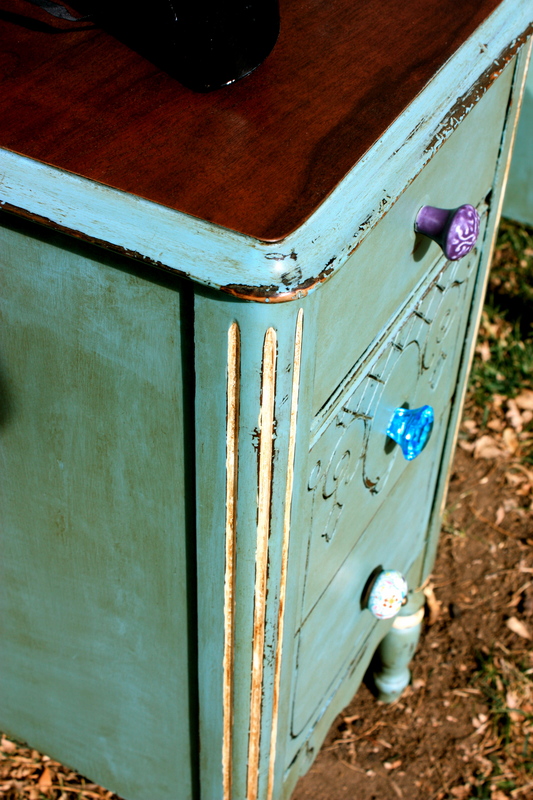 Just look at those beautiful pulls and knobs! The colors, just like those of the ocean waters that inspired The Atlantis, change with different lighting…going from bright and vibrant colors in the first photo to the more subdued and calm colors in the photo above. I just love that. The sun really brought out her brilliant colors…and made things a little tricky for me when photographing…but it was totally worth the extra effort. I hope you love The Atlantis as much as I do! Thanks for stopping by. If you are interested in owning this beauty, she’s up for sale in the Etsy shop. One of my favorite movies is “To Wong Foo, Thanks for Everything -Julie Newmar.” It’s a campy cult classic starring 3 silver-screen veterans, Patrick Swayze (RIP), Wesley Snipes, and John Leguizamo, who are cast as glamorous drag queens from New York City embarking on a cross-country journey in an old beat-up Cadillac convertible in order to participate in a Miss USA style drag pageant. If you haven’t seen it, I highly recommend it. It’s hilarious, colorful, campy, as well as being very moving, inspirational, and touching. Anyways, the reason I brought this up is because of the opening scene. In the opening scene Patrick Swayze sits in front of an antique vanity while putting his face and body on, and we watch through the mirror of the vanity as he undergoes his transformation. 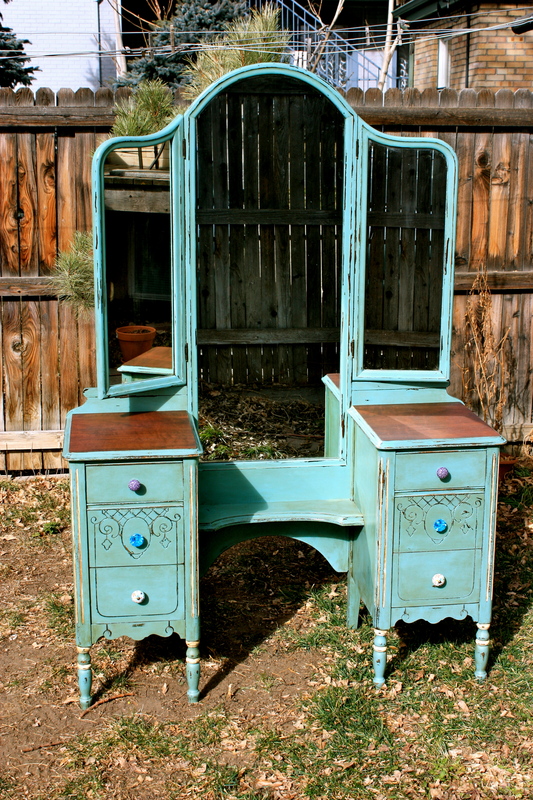 And, I have always loved that vanity! 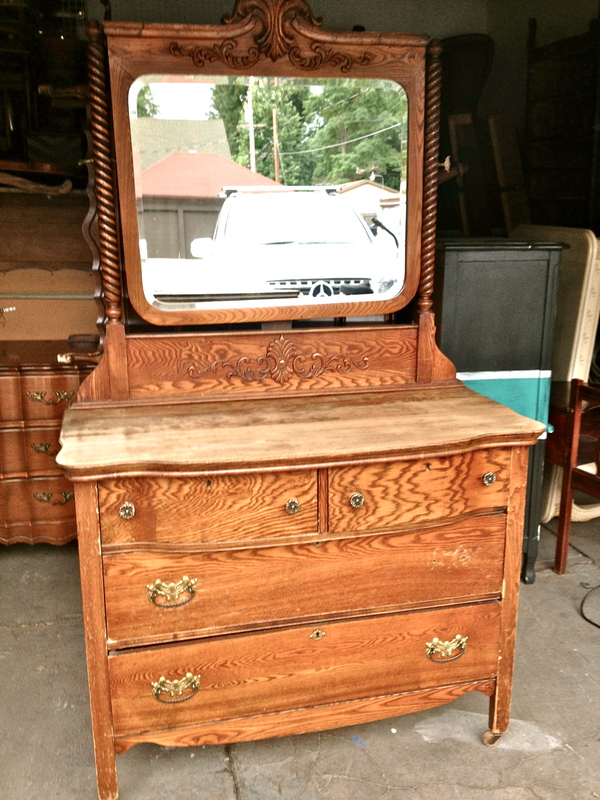 So, when I came across this old vanity, I just had to have it! Sadly, it had seen better days. It was dinged and scuffed up pretty bad, had water marks all over the tops, and the tole painting on the details of the front was peeling off. 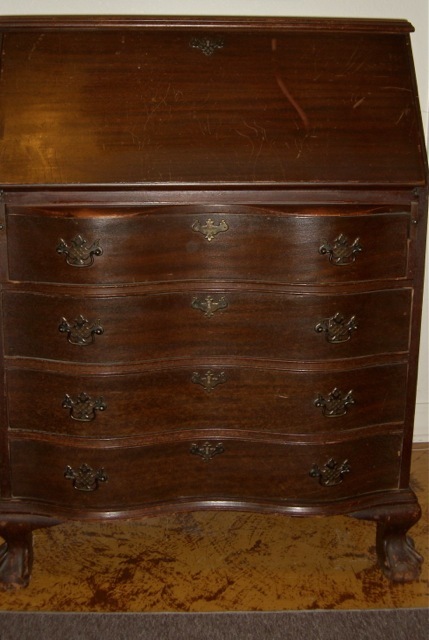 There was just no way to save the original finish or to restore it without spending a fortune. BUT…it was in perfect shape for a wonderful shabby chic finish…so that’s what it got… Meet The Alexandria! I painted her in a lovely aqua green-blue shade that allowed her lovely details to steal the show. I also added just a little bit of white highlighting on the posts and legs to draw attention to the less loud detailing. 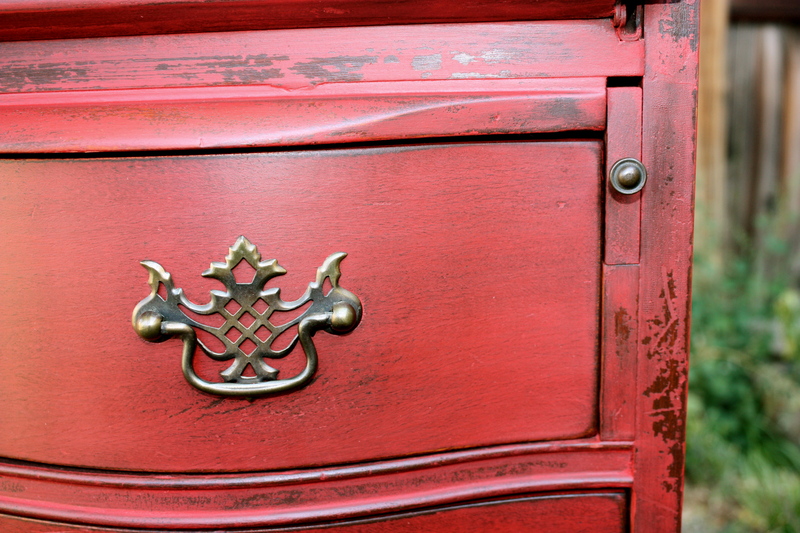 And, of course, it can’t be shabby chic without lots of distressing…so I beat her up pretty good and rubbed her bare in all the places a heavily used vanity might show wear and tear over the years. 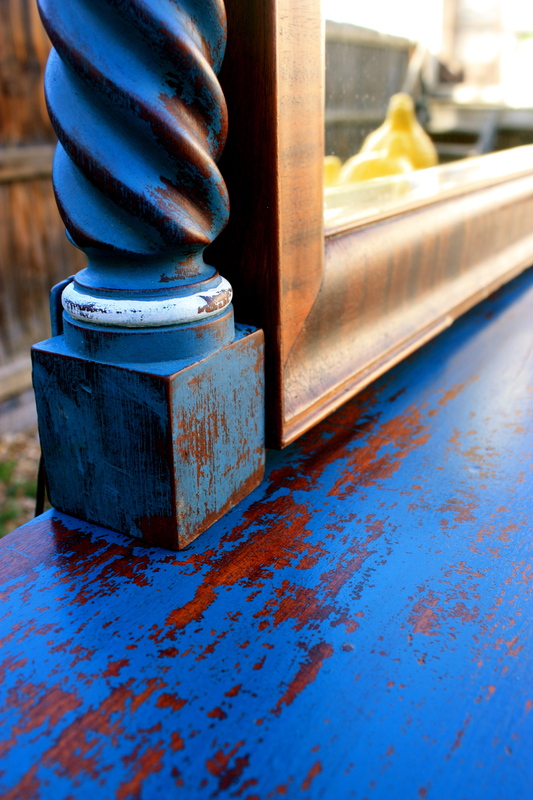 The contrast of the reddish toned stain with the aqua green-blue paint is stunning! And look at all the character the distressing gave the piece. To finish her I used a heavy-handed dark waxing technique to mimic dirt and dust settling into all of the nooks and crannies and brush strokes in the paint. I just love the wax the wax shows off all of that wonderful routed detailing on the drawers that the tole painting once highlighted. I just love that purple ceramic knob on the top! 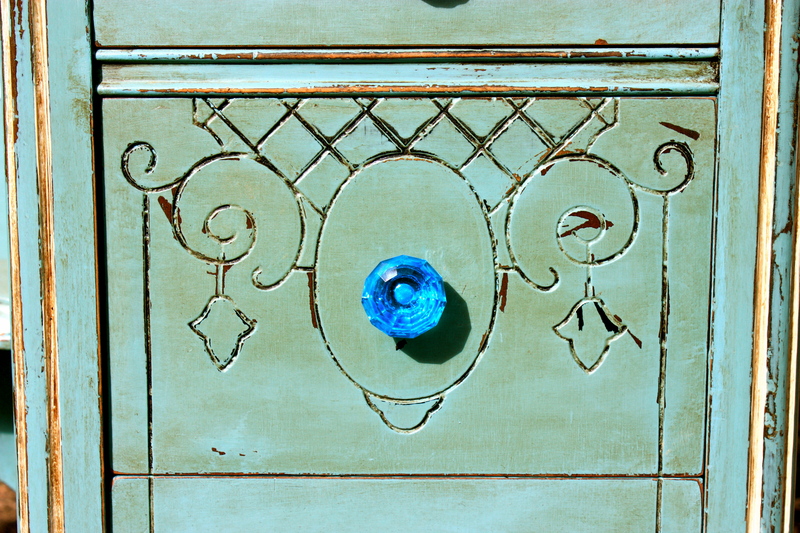 The middle knobs are a pretty light blue glass and the bottom knobs are a white ceramic with oranges, reds, blues, and purples painted on. No chihuahuas were harmed in the photoshoot. I don’t know if it was the angle the sun was at, or if it was the adorable chihuahua stealing the show, but for some reason I just couldn’t get the correct color to show up in this photo. But little Boston is too distracting to notice anyway, amirite? He’s giving fierce model face…just like the drag queens in To Wong Foo! 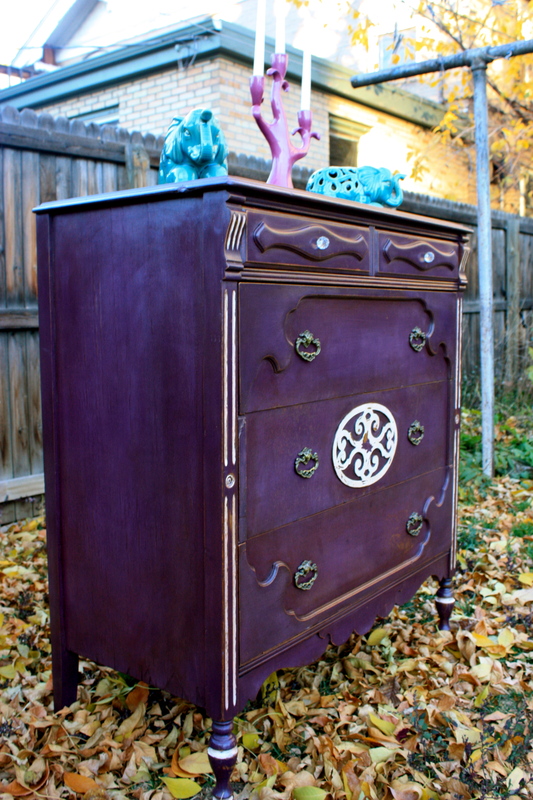 The Alexandria is up in the Etsy shop now and is ready for her new home. 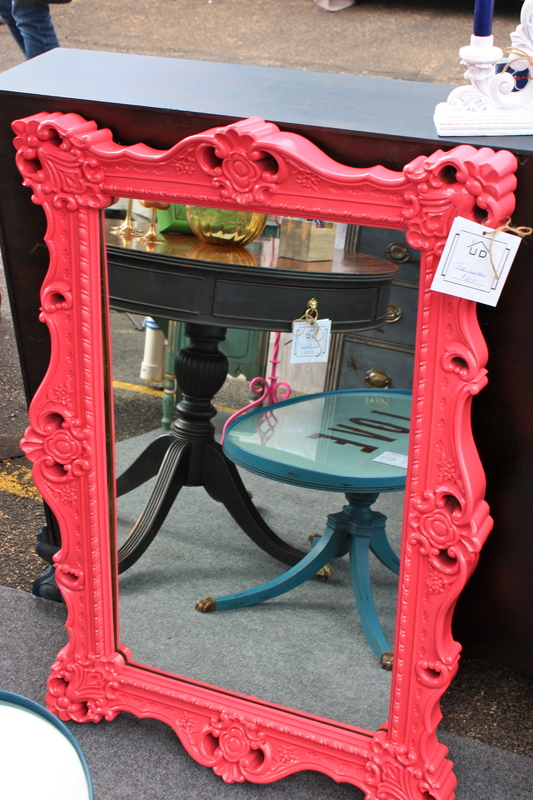 She’s perfectly imperfect, perfectly beautiful, perfectly shabby chic, and she would be a perfect addition to any fabulous woman’s room, or the room of a fabulous little princess, or she’s even fit for a fabulous and fierce drag queen like Miss Vida Boheme herself! What do you mean I’m a couple of weeks late? I don’t know what it is about the holidays, I always seem to lose track of time. Maybe it’s the egg nog, or maybe the absinthe, or maybe ol’ Jack Frost sends me into a Van Gogh-like state where I lock myself in my house with my artwork and wine and don’t re-emerge until sunshine and warmth return. Truth be told, it was a little of all three…with a lot of family and holiday fun sprinkled in. I did find time to finish a few pieces and get a few others very close to finished. Today, I’ll share with you one of my most favoritest (it’s a new word!) pieces I’ve ever done. Ever. 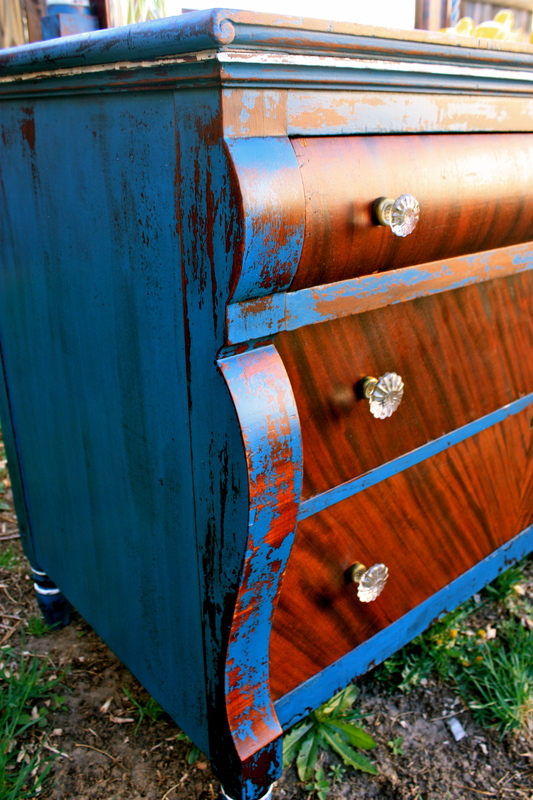 This may sound like hyperbole, especially when you consider that I mention how much I love every piece of furniture I transform, but this time I really, really, really mean it! You may be asking, “what’s so special about this piece that you have yet to tell us about Pelham?” One. Simple. One-word. Answer. PURPLE! Purple purple purple purple purple PURPLE PURPLE PURPLE PURPLE! I never realized what a fun and weird word that is until I typed it out a million times just now. I guess that is fitting because I personally think the color purple is super fun and awesome. It’s my favorite color; purple is both masculine and feminine, it’s rich (after all, it IS the color of royalty! ), and it’s extremely versatile. 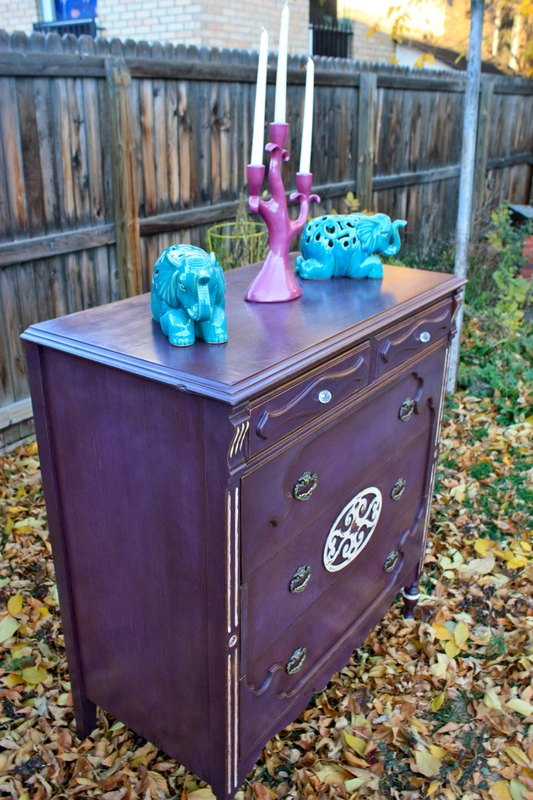 I have wanted to paint a piece of furniture in purple for the longest time…I just never came across a piece that asked for it. Isn’t it lovely? I think this shade of purple is both cool and warm, light and smokey, rich and subtle. 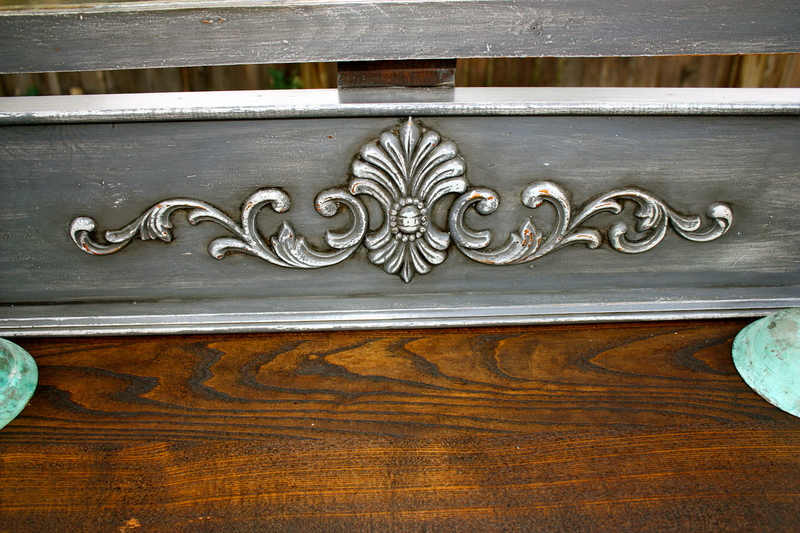 I used antique white to highlight some of the details and lightly distressed the edges to invoke the age of the dresser. 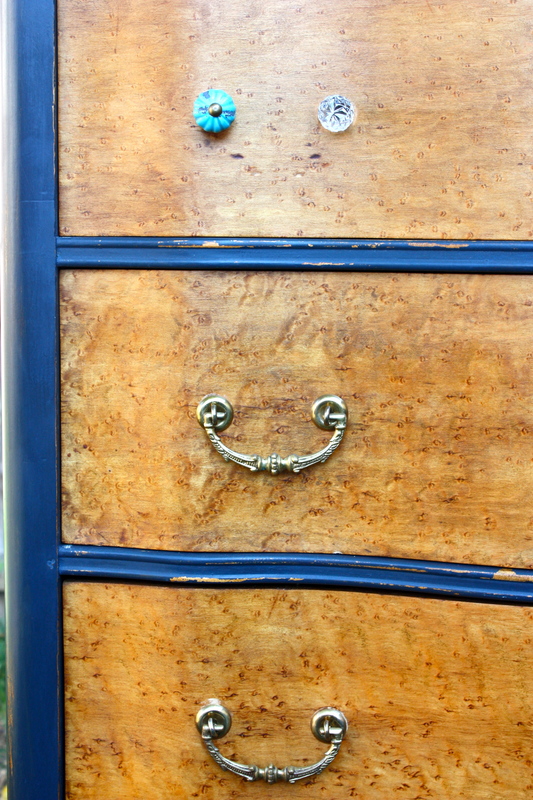 While I loved the original, ornate drop-pulls, I didn’t care too much for the knobs on the upper drawers and replaced them. Nothing says New Orleans brothel or Bohemian boudoir quite like cut-glass! And because I wanted this piece to look as if it had been in the brothel or boudoir for decades, surrounded by cigarette smoke and kerosene lamps, I used a heavy-handed dark wax technique to mimic years of smoke exposure (without the bad smell!). I think the effect is just wonderful. What do you think? Let me know by leaving a comment! I always appreciate hearing people’s opinions. 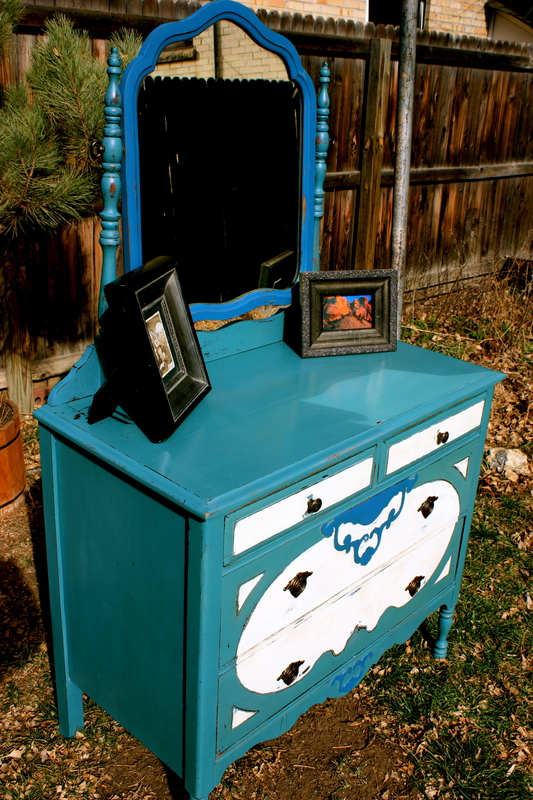 *I have been using this dresser in my own house for 2 months now. I’ve not been able to bring myself to sell it. However, I don’t really have the space to keep it…so it is now up for sale in the Etsy shop. 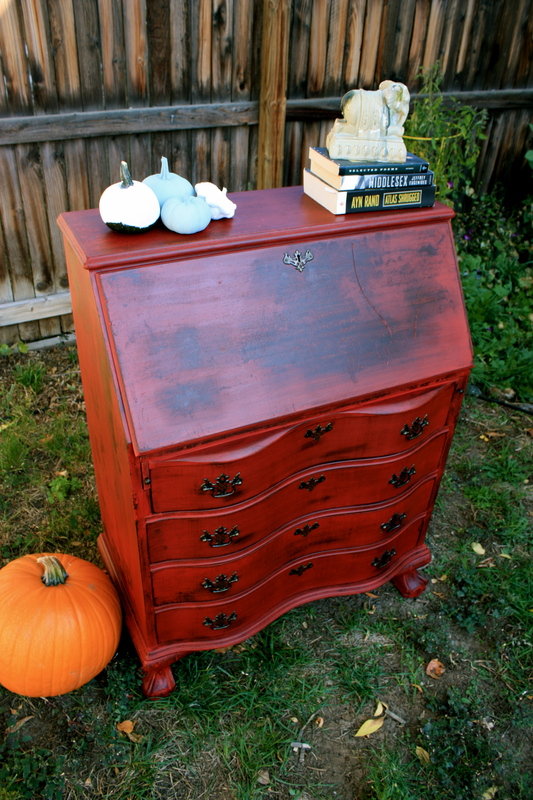 A couple of months ago I was approached by a prospective client inquiring about incorporating red in a dresser makeover for their recently re-designed master bedroom. 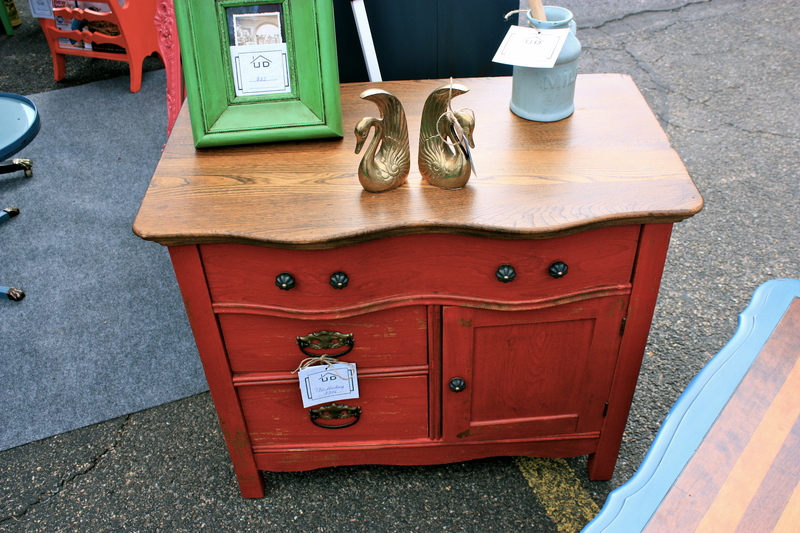 They were big fans of the ultra-chippy, shabby look and were envisioning a white chippy dresser with red drawer fronts. As with every custom order, I always start by consulting with the client, looking at the space the piece will be in, and create an idea board, of sorts, for them. 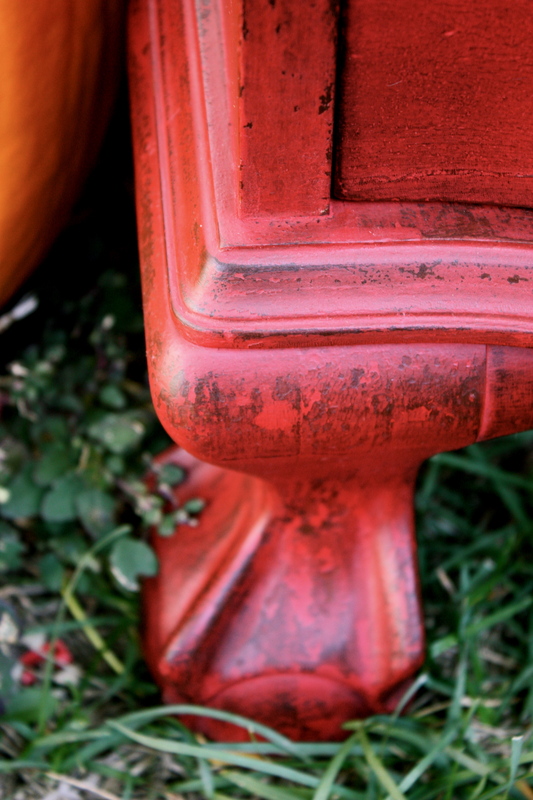 While pulling inspiration photos for them, I kept thinking of how I had always wanted to do a very chippy, barn-red piece and found some great inspiration photos of similar dressers to present to the client. They loved the idea of a solid red piece! Love it! 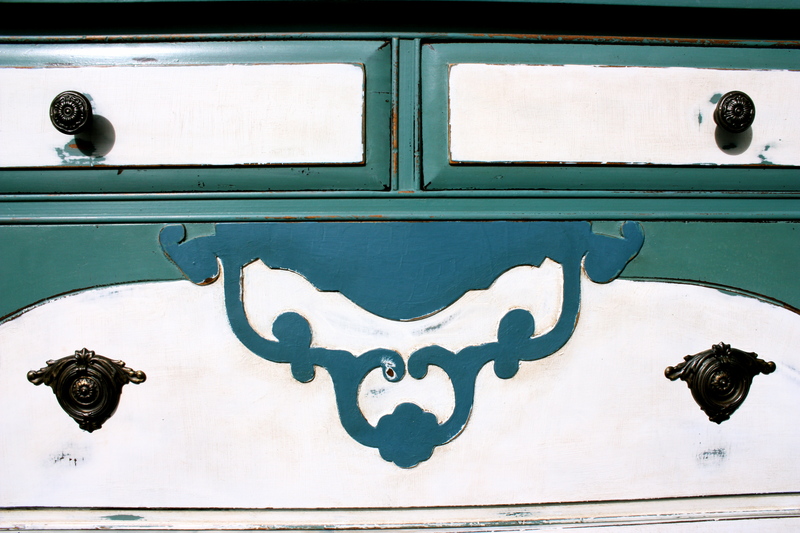 Love the serpentine drawer fronts. Love the eagle’s claw feet. Love the brass, batwing pulls. Love the skeleton keyholes. 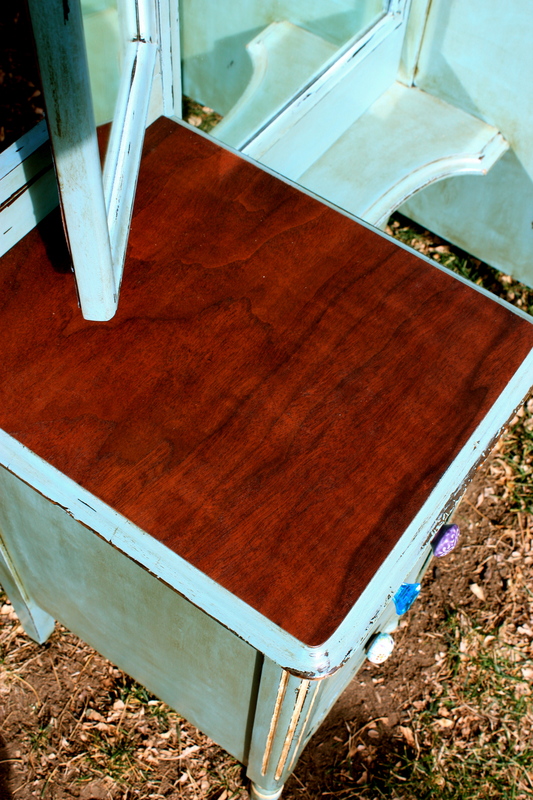 Love the mini-cabinet, mini-drawers, and hidden compartments inside the drop-down. Love, love, love! 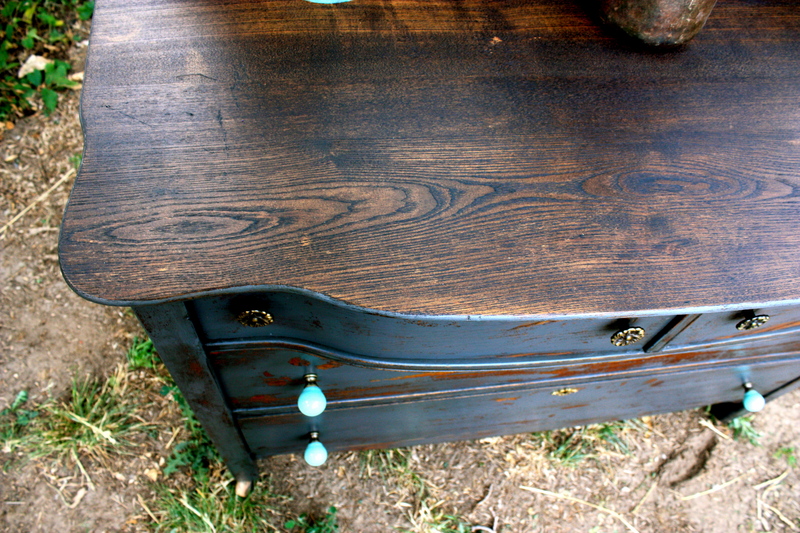 This piece had it all…great lines and design, a classic look, a great dark stain, just the right amount of wear and lovingly aged. 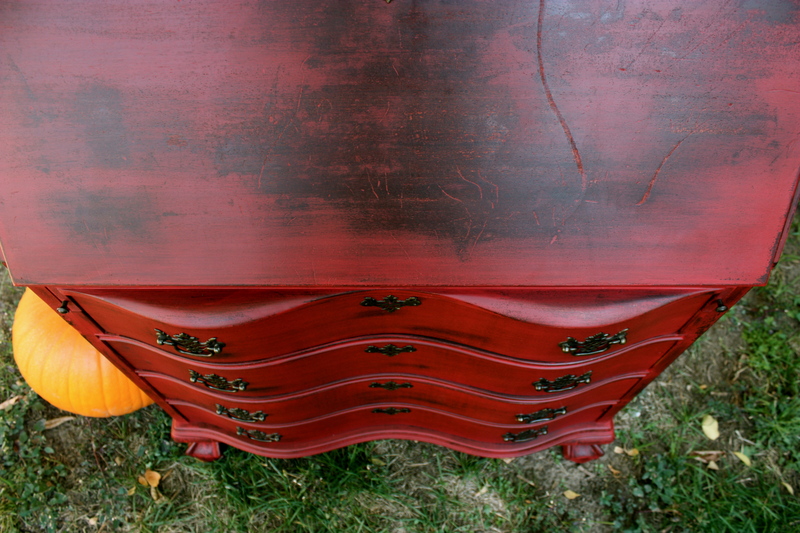 As soon as I saw it, I knew it was the perfect piece for the chippy, barn-red treatment I’ve been eagerly wanting to do. And thus, The Huntsman came to be! 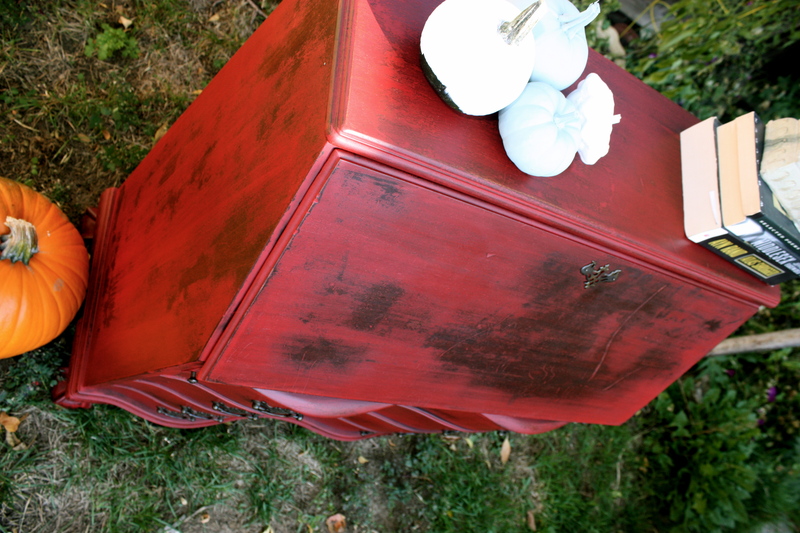 Perfectly shabby and beautifully red! 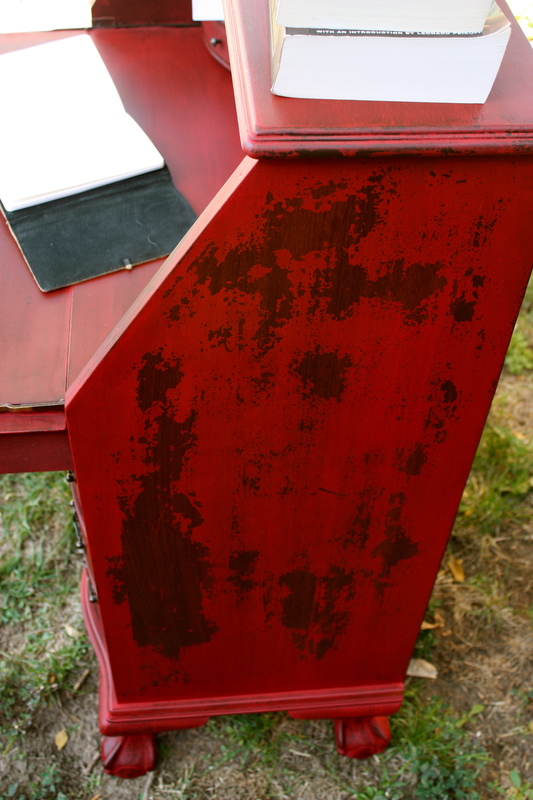 When I brought the desk home it had quite a few scratches and gouges on the face of the drop-lid. I was about to fill them in and sand them down when I thought better of it. Why not keep them? They would fit perfectly with the well-loved, ultra-chippy, shabby look that I was going for. And so they stayed. And a big part of me thinks the piece would look incomplete without them. Check out this wonderful chippy goodness! 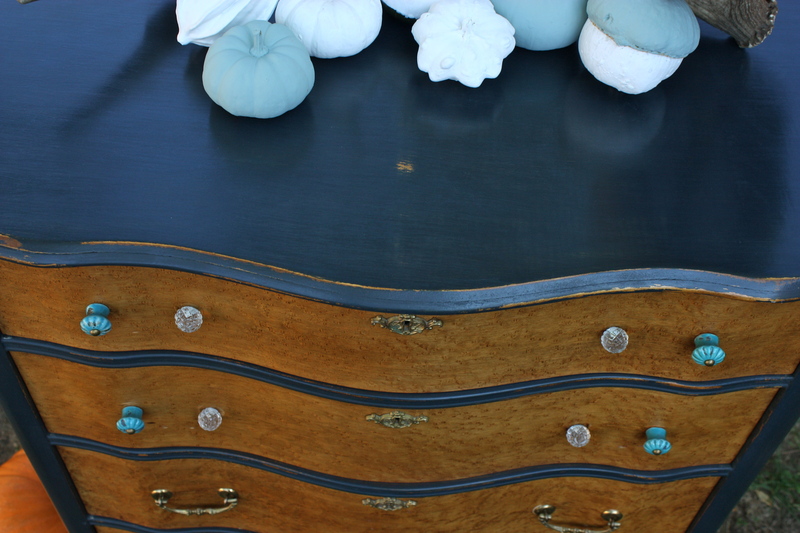 And lastly, this desk’s original brass hardware fits perfectly with the new looks! What do you think? 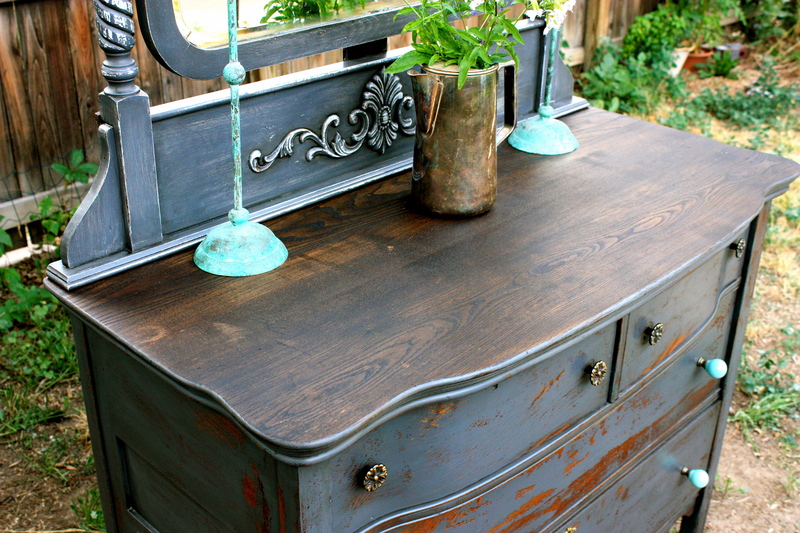 Are you a fan of the ultra chippy and shabby look? What about RED…do you like red? Let me know what you think! 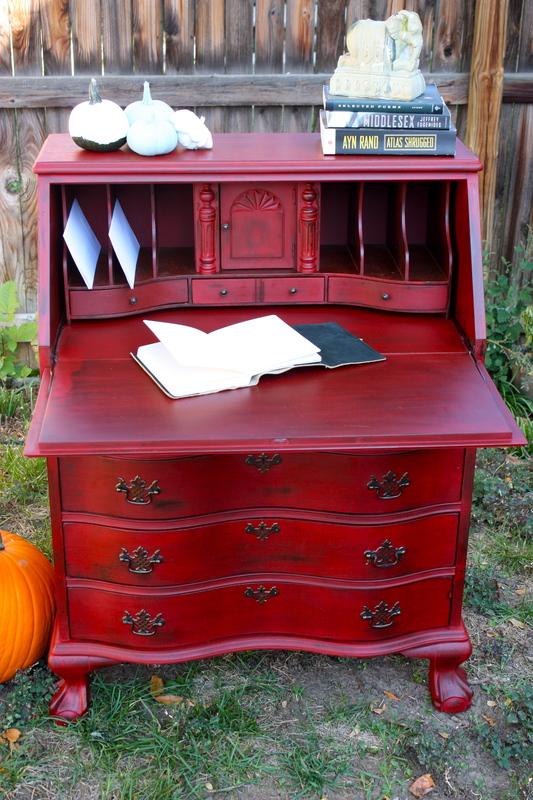 This cute little secretary is available for sale in my Etsy shop! 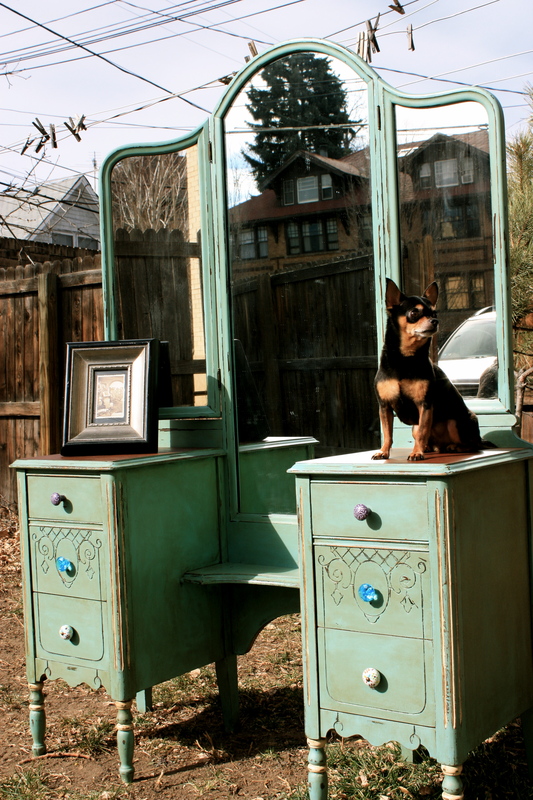 As you may have guessed by now, I paint furniture. 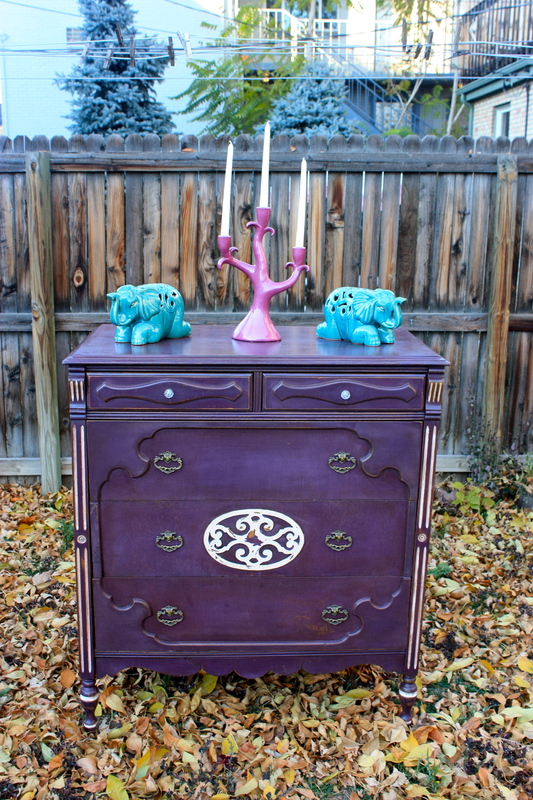 I love painted furniture and I love painting furniture. My aesthetic generally trends towards taking beautiful, vintage and antique pieces that have interesting detail and/or classic lines, that have seen better times, and revive them and give them a modern twist with bold, saturated color choices. 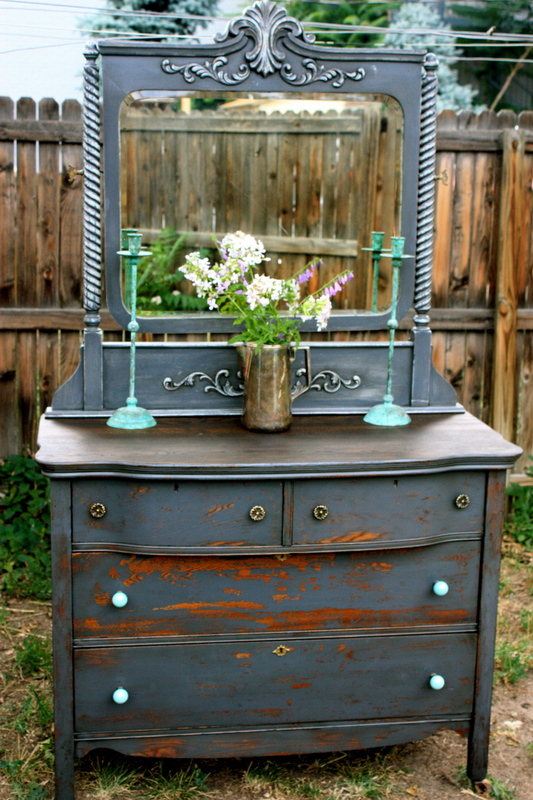 I also am very fond of the uber chippy and shabby look on more utilitarian and farmhouse style antiques. I, mean, I’ll seriously try to paint pretty much anything I can get my hands on. With a few notables exceptions. Quartersawn (tiger) oak? Not painting. Rosewood? Not painting. 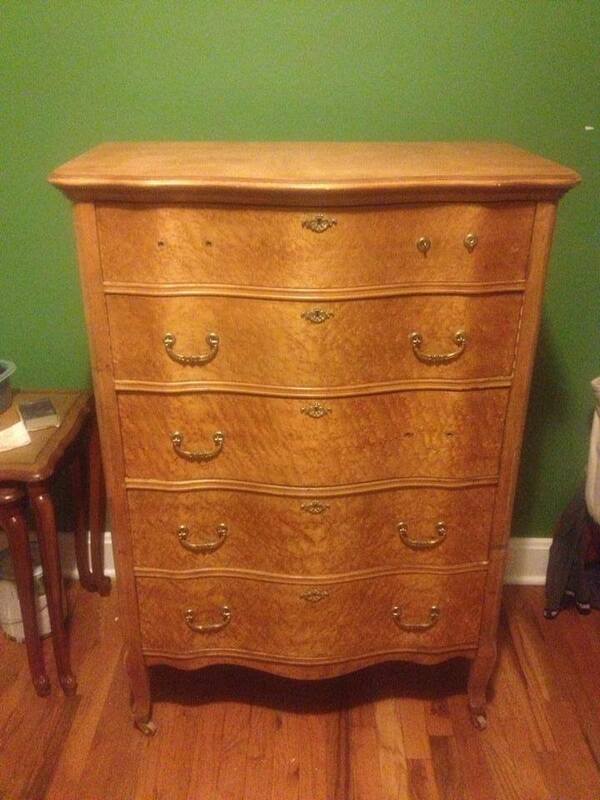 Most dresser tops, desk tops, table tops, etc that have interesting wood grain and are in good condition? Not painting. And Bird’s Eye Maple!?! Definitely NOT painting. 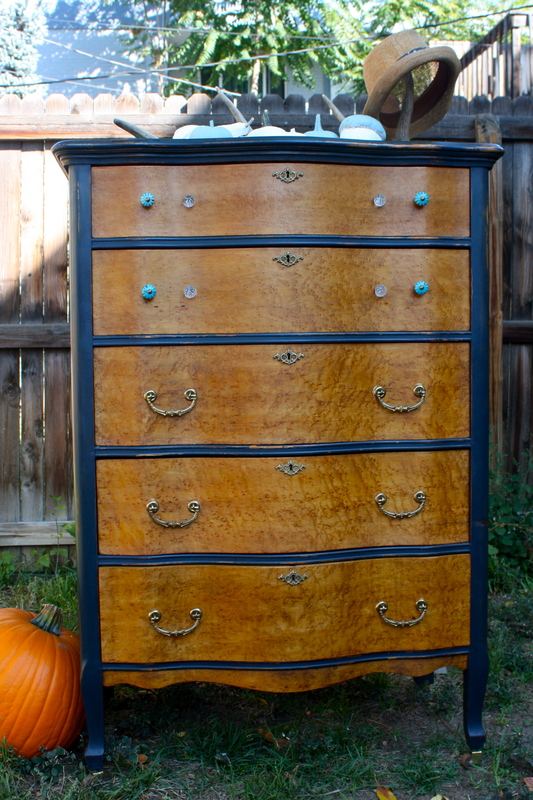 When I went to pick up The Huntsman (a craigslist find), the people also had this wonderful early century, serpentine tallboy that they were trying to find a new home for. Obviously, I jumped all over it! And who wouldn’t?!? 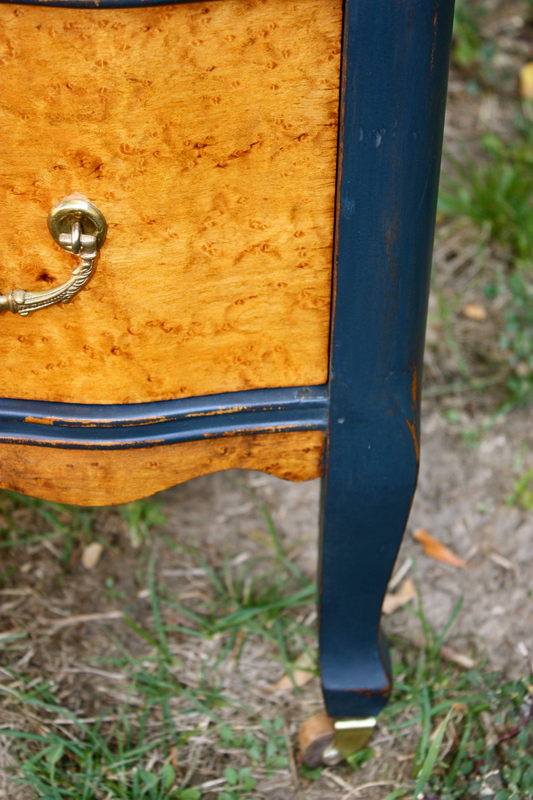 The bird’s eye maple veneers on the drawers were flawless and absolutely beautiful. 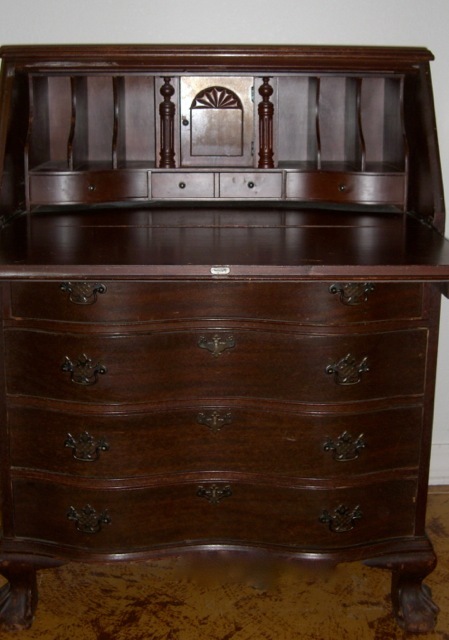 In fact, other than missing some hardware and having a broken drawer, the rest of the dresser was also in good condition. But I paint furniture. And this piece was not going to completely escape a paint job. At first, I thought I was just going to paint the top, the rails, and the legs. But upon closer inspection, the bird’s eye veneers on the sides had been refinished at some point, with a stain that wasn’t an exact match, and whoever did it had nearly sanded right through the thickness of the veneer. Not even close to mint condition. So the sides got the paint treatment, too. Because I wasn’t going to do anything more than revive the drawer fronts with some oil (they were quite dry), I knew that whatever color I chose was going to need to not just complement the light honey tone of the drawer fronts, but also not be so bold as to distract from them. It just so happened that I had just received a shipment of some new colors, and one of them, a deep and rich navy, was just what I was looking for! 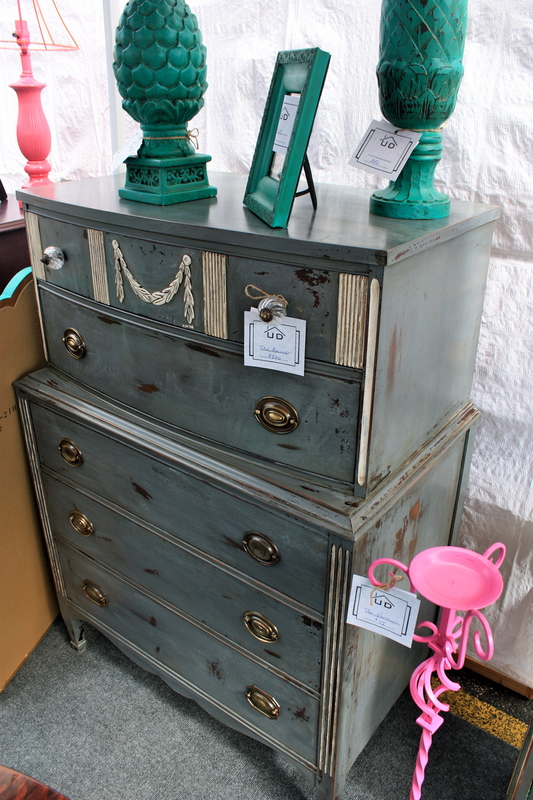 Look at how those drawers immediately catch your eye! 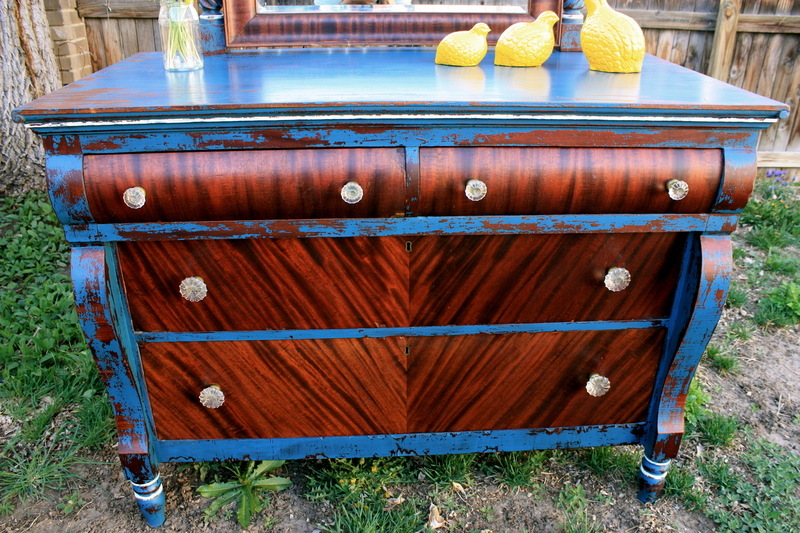 This dresser exudes richness and style. The Eleanor is just lightly distressed on the corners and edges, hinting at her age, but not distracting from the star of the show. Just look at this beautiful bird’s eye maple! 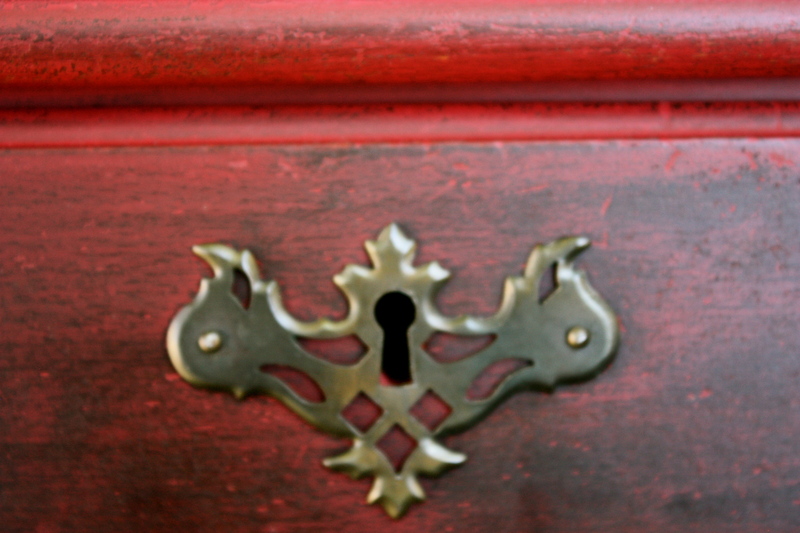 I kept the brass drop-pulls on the 3 larger bottom drawers but felt their size and style cluttered the top two smaller drawers. 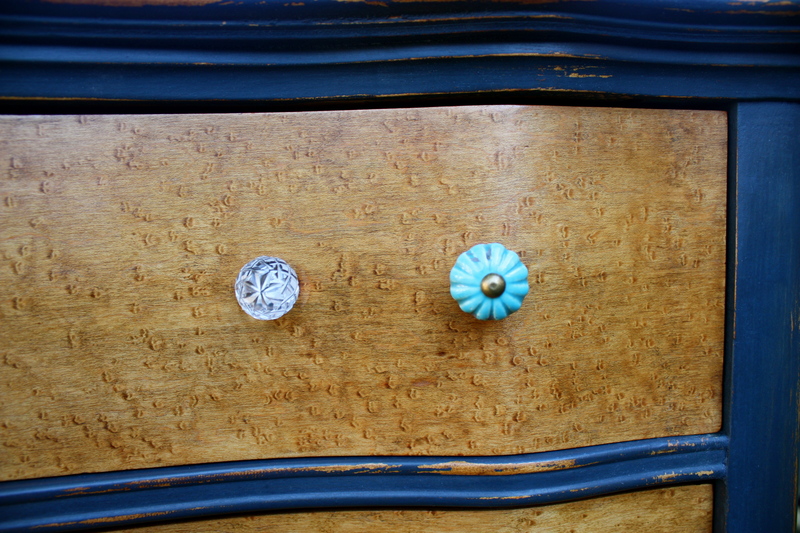 In their place, I chose two different knobs…one is a small, cut-glass knob that seems to almost blend in with the bird’s eye, and then a more bold distressed turquoise ceramic knob that plays well with the navy and maple. What do you think? Feel free to leave your comments and give me your opinion. The Eleanor is for sale and can be found in our Etsy shop! Ever since I finished The Coloradan, there has been quite a bit of interest from people wanting me to create a custom version with their favorite Colorado destinations. That’s how this particular dresser started its journey. 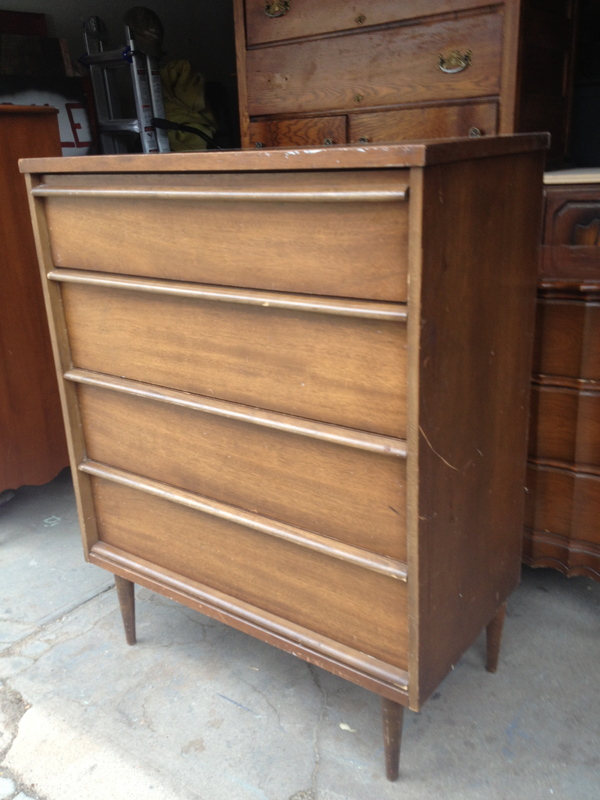 Right as I was about to start laying paint down on this beautiful mid-century modern, peg-leg chest from Basset, the client changed her mind! 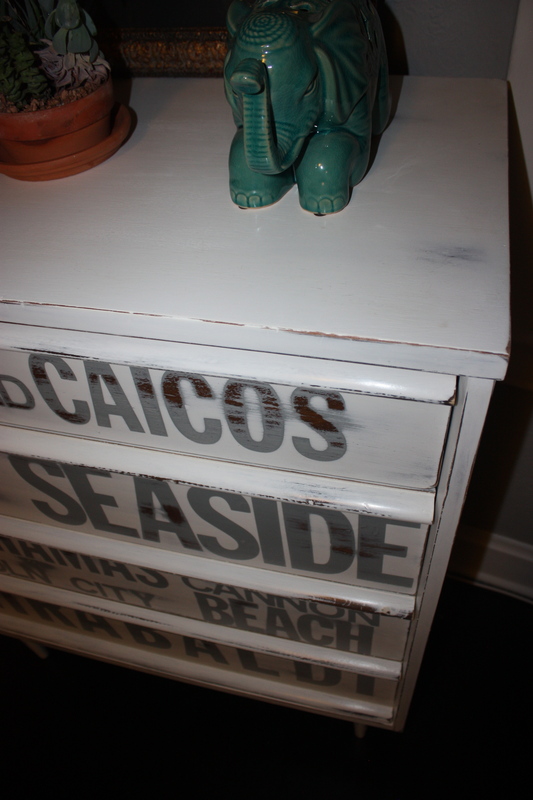 Instead of a rustic, black, mountain themed dresser, she decided she wanted a beach-cottage feel for the room this was going in. No problemo! 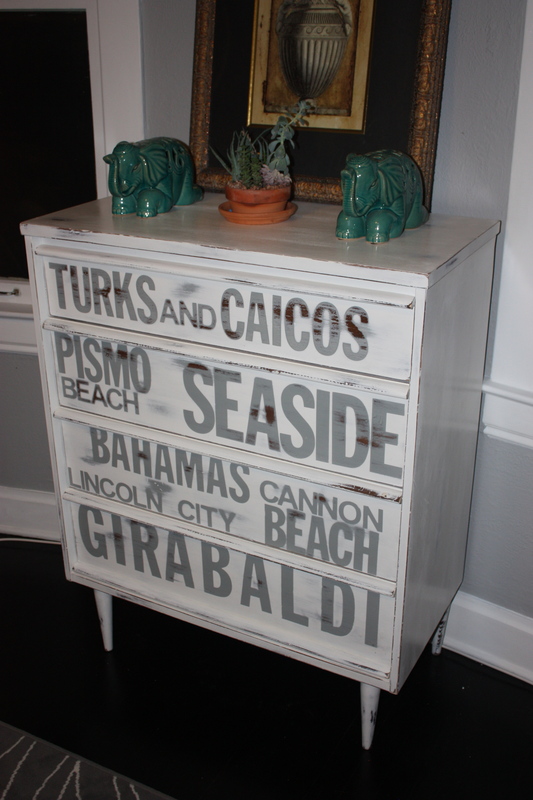 Having grown up near the beach in Florida, I was actually very excited to create a beach-cottage piece. 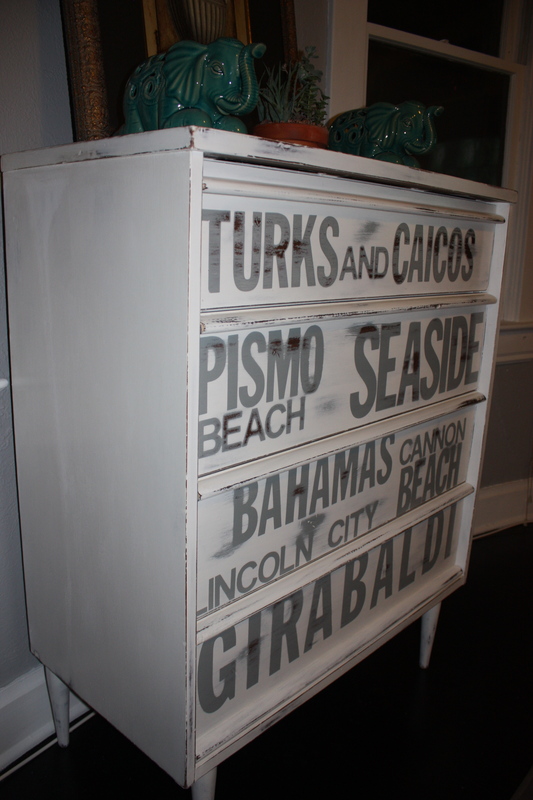 Beach inspired furniture isn’t exactly a big thing in my neck of the woods, ya hear? So, and this might not be all that surprising, I had to dig out my quart of white chalk paint from under all of the saturated and bright colors. It was quite the ordeal. Considering how this piece turned out, perhaps I should keep that white more accessible! Doesn’t it look fantastically beachy? All that white, distressed grey, and the original wood peeking through just looks so beautiful together. The locations are all beaches and towns that hold special meaning to the client (she was absolutely thrilled and floored by the final product). 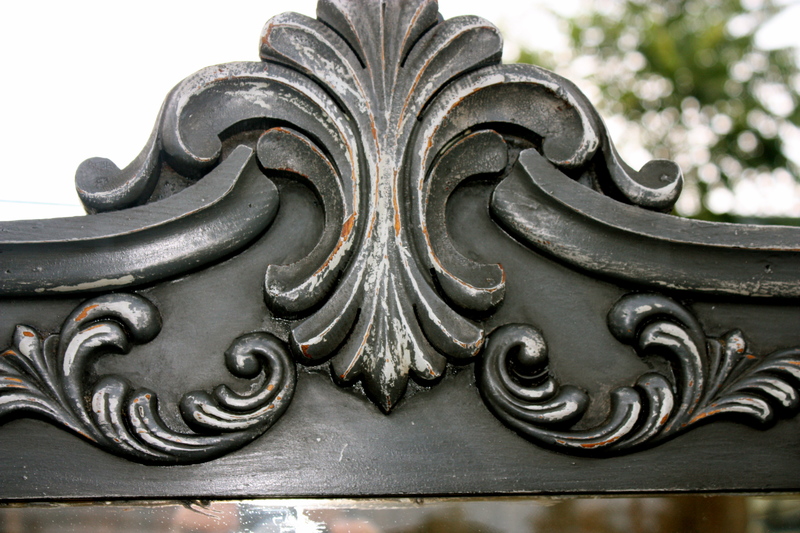 To achieve this look, I first prepped the piece for paint. 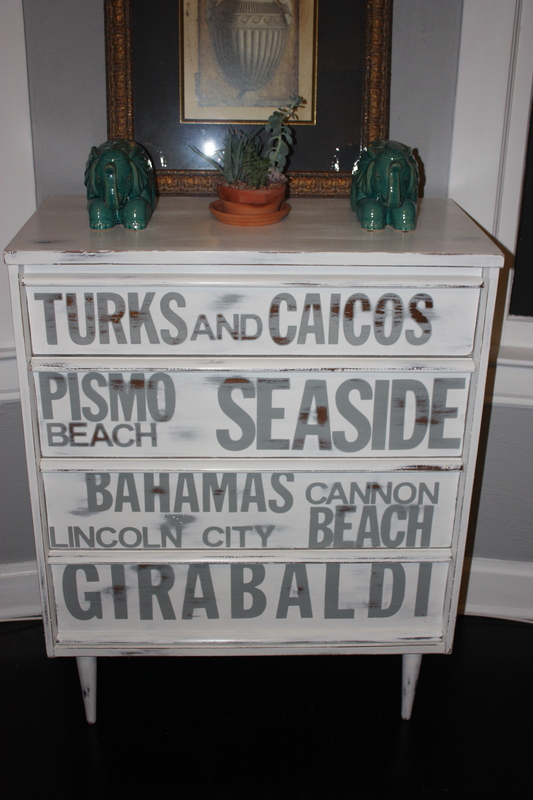 I didn’t bother fixing the dents and gouges because they were perfect for adding character to the beach cottage theme. 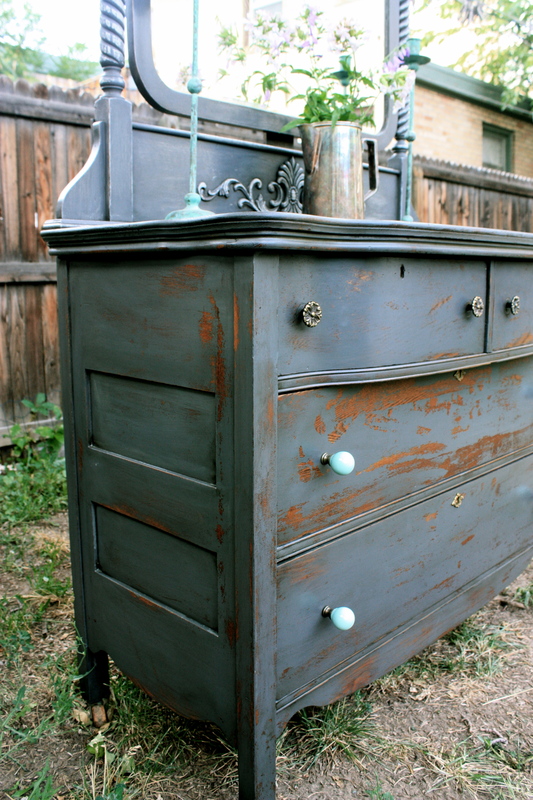 I then painted the drawers a medium grey in preparation for the lettering. Before I was ready to paint the entire piece with the bright white, I had to map out the locations. After using lots of scrap paper, and the crazy visions in my head, I finally found a layout that made sense to me and would be the most visually pleasing. Lay down the letters and pick the paint brush back up…I painted…ahem.. a few (pure white takes SO many coats of paint) coats of the white before I was finally happy with the look. After the paint dried, I pulled the letters and then found my trusty sanding sponge. Lots of elbow grease, hemming and hawing, and determination finally led to a perfectly shabby, beach-cottage feel. If you are interested in having me create one of these subway-poster inspired pieces for your home, please email me and we can design something that is perfect for you! Running two businesses generally means there is little time for planned vacations that have any sort of length to them. 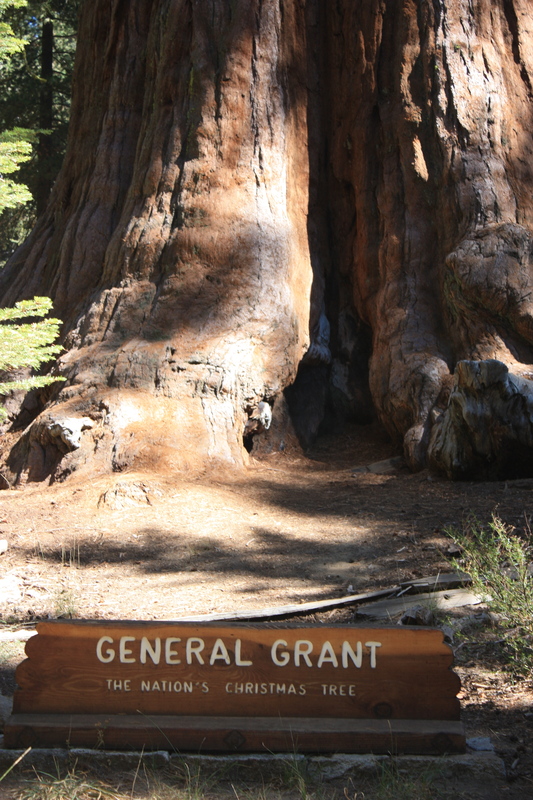 So, usually, I take a day here, a weekend there, a trip to the hot springs, an overnight camping trip, etc. These little forays are generally suitable for recharging my batteries and eradicating stress…vital necessities to managing my time and squeezing every ounce of productivity I can out of each and every day. However, these little trips only seem to bring me balance for small periods of time…meaning, the more stressed out I get, the more frequent these trips need to be in order to maintain sanity. Well, sometimes this gets to be much like putting a band-aid on a wound that requires stitches. By early August I was at a point where I was utterly exhausted and my days started to seemingly move backwards. It was time for a break. Due to some big trips I have had planned for 2014 for a long time now, I had hoped that I could make it through 2013 without needing an extended vacay. 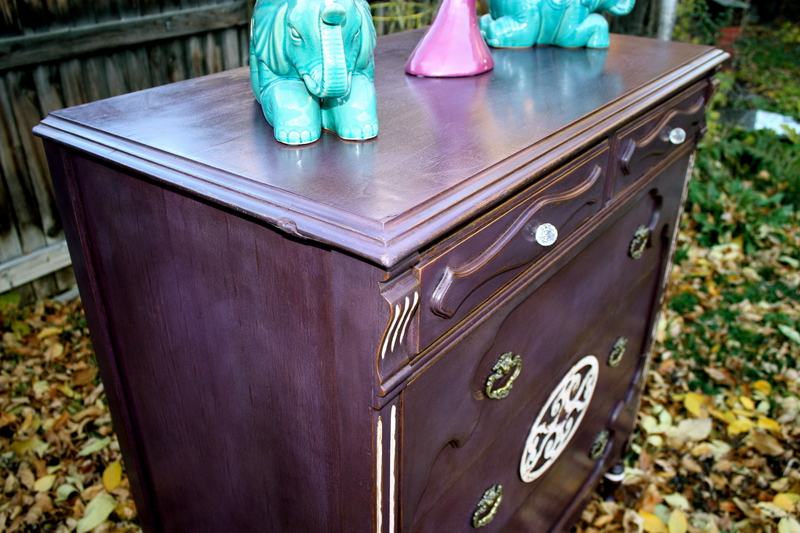 So, of course, I hadn’t planned on taking a month long hiatus from the blog and painting furniture. In fact, since I wasn’t going to actually be away from home nonstop for a month, I had hoped that I could get a few pieces done and write some new posts between trips. It is quite obvious I failed at that. After working 13 days straight to start August, I then had family visit for a week and we had a wonderful time. Having moved to Colorado from Florida, I usually only get to see family once or twice a year and almost always have to go back to Florida to see them because they are scared of the dry air and cold weather that we experience in Colorado. It’s a moment to cherish when they actually come and visit me! So, while family was in town, I ignored all work and stuck to showing them a good time. After my family left, it was time for a small trip to Steamboat Springs to soak in the hot springs, watch the annual USA Cycling Pro Challenge stage race, and enjoy some late summer camping in the mountains. 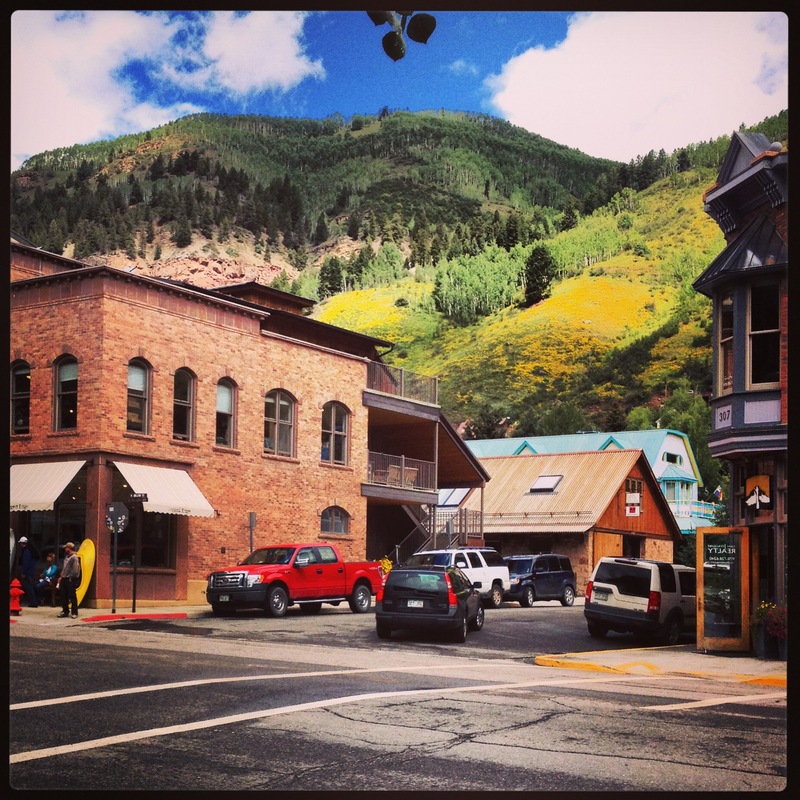 One of my favorite “vacations” has always been a Colorado “staycation.” Makes sense when you consider that so many non-Coloradans make Colorado their vacation destination. After the Colorado staycation, one of my best friends from Florida came to visit. We headed straight for the mountains and then quickly learned our camping plans were in for a rude awakening. Yes, she happened to be here the week of the great (and devastating) Flood. We drove all day through the rain and as we got close to the western slope, we quickly nixed the idea of camping in the cold, wet rain. Pretty rational, no? 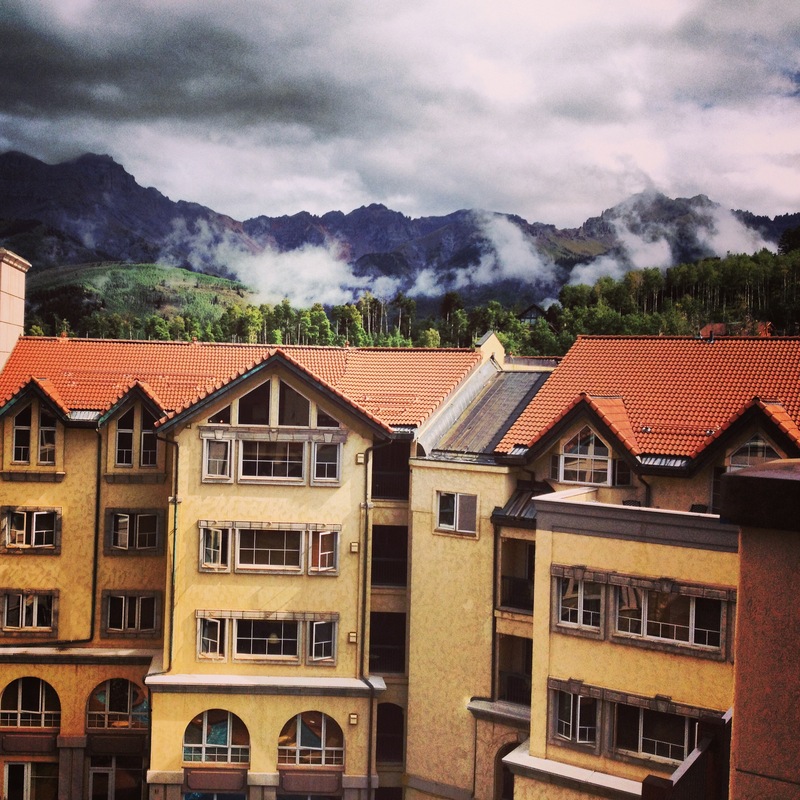 Lo and behold, the crazy sorcery that is called Priceline found us an amazing deal on a 5 star hotel at the ski resort area of Telluride. 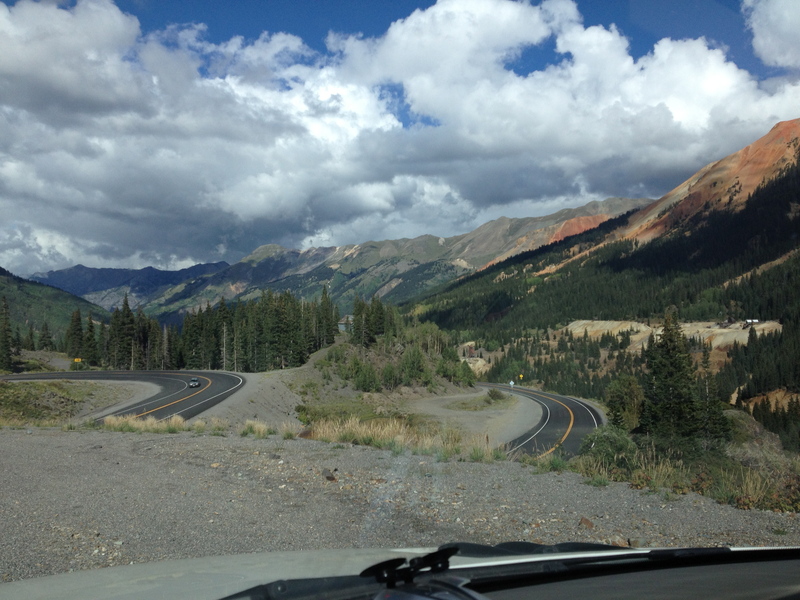 We spent a few days dodging scattered thunderstorms during the day to take in the sights in Ouray, Telluride, Silverton, and the Million Dollar Highway. At night we pampered ourselves in 5 star luxury on a Holiday Inn Express budget and we reveled in memories from college. Too bad we couldn’t stay forever! Once she flew off to Florida, it was finally time to get back to work! Or so I thought. I did manage to get a custom order done (will be posting that, along with some other new pieces, asap) and then ended up planning an impromptu trip to California to pick up a new-to-me Harley Davidson motorcycle. In addition to painting furniture, skiing, hiking, and camping…I also love riding the backroads of America on two wheeled vehicles…both bicycles and motorcycles. 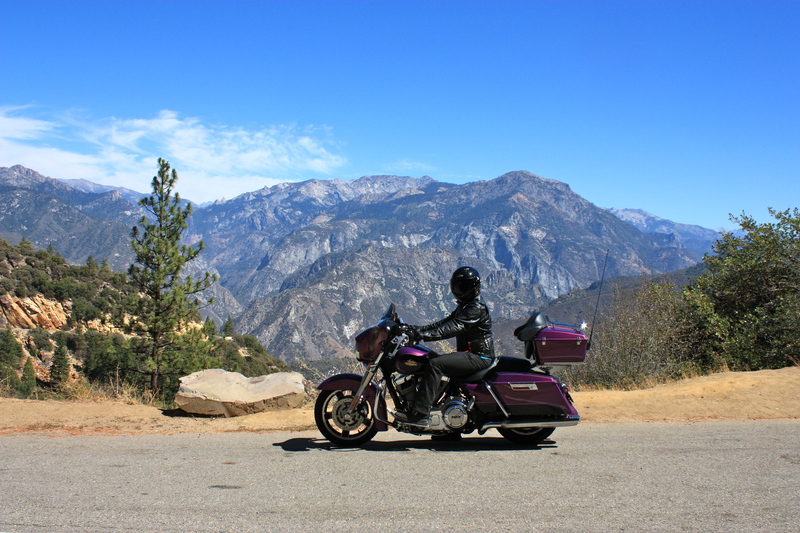 So, when I found an amazing deal on a purple Street Glide in the Bay area, I literally jumped on it. I booked a one-way flight and was on my way to Cali quicker than I could stop and think. Once I picked up the bike, I rode to Fresno to meet up with some friends who used to live in Denver. 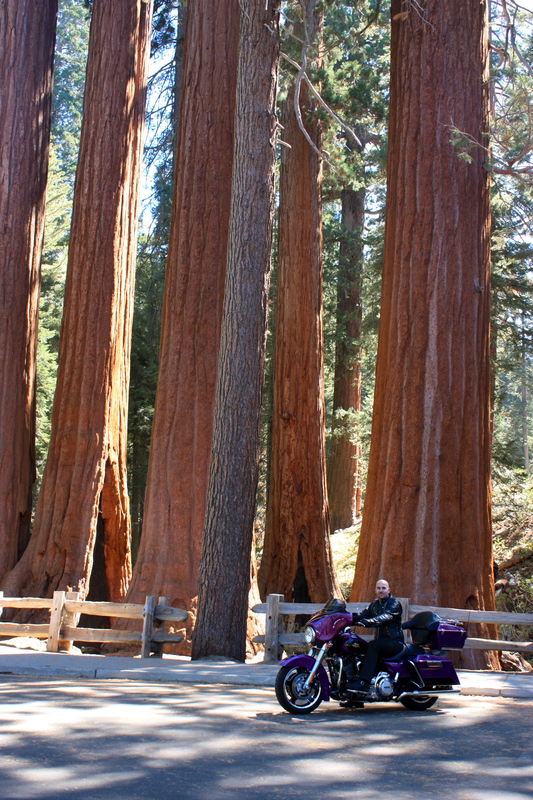 We spent a couple days riding through Sequoia National Park and King’s Canyon National Park. If you’ve never been, I highly recommend it. 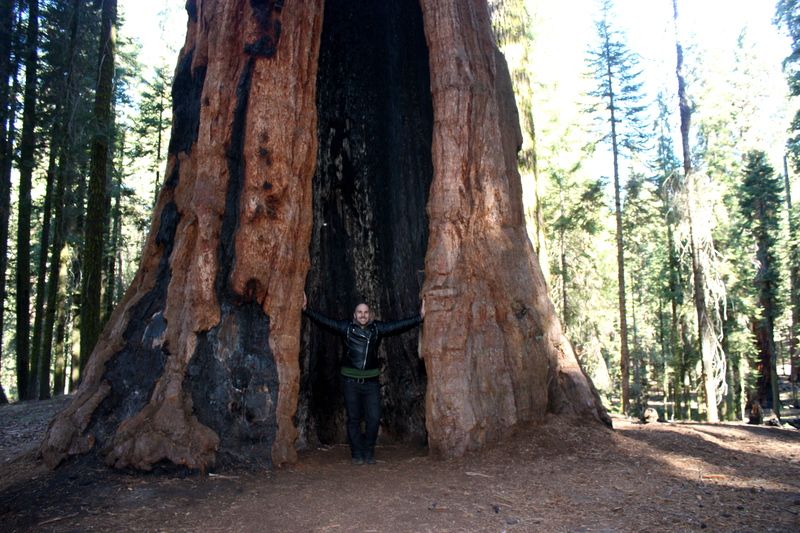 Giant sequoias have to be one of Mother Nature’s coolest creations. After leaving King’s Canyon National Park, I spent one last night in Fresno with my friends before hitting the road through Sequoia National Park and south to Palm Springs to meet up with my parents who had just finished traveling the entirety of Route 66 from Chicago to LA on their motorcycle. 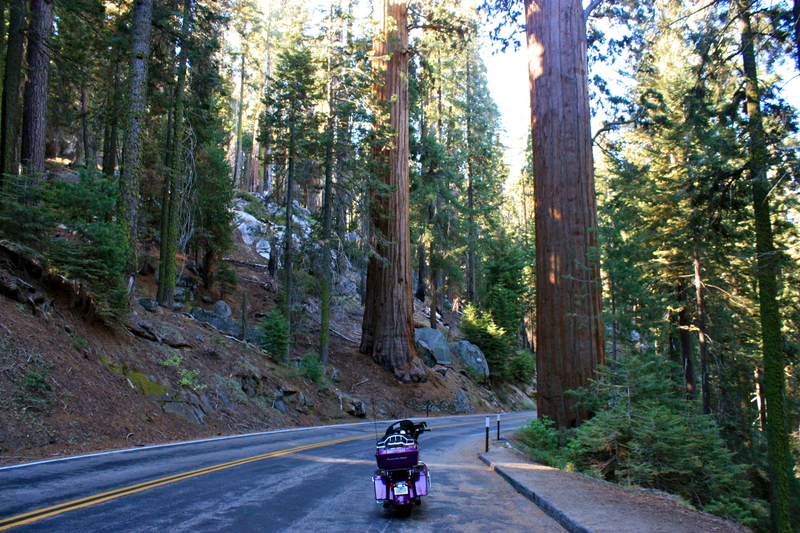 After this foray into a magical fairy land of ginormous trees, I put the rubber to the road and ate up the miles on the way to Palm Springs where I literally felt like I was going to melt in the heat. 115 degree temperatures, seriously? At least they had a pool and poolside bar churning out the frozen daiquiris! When I met up with my parents, we spent a day riding through Joshua Tree National Park. Another of Mother Nature’s wonderful creations, the Joshua Tree, couldn’t be more different from the towering, evergreen sequoias. 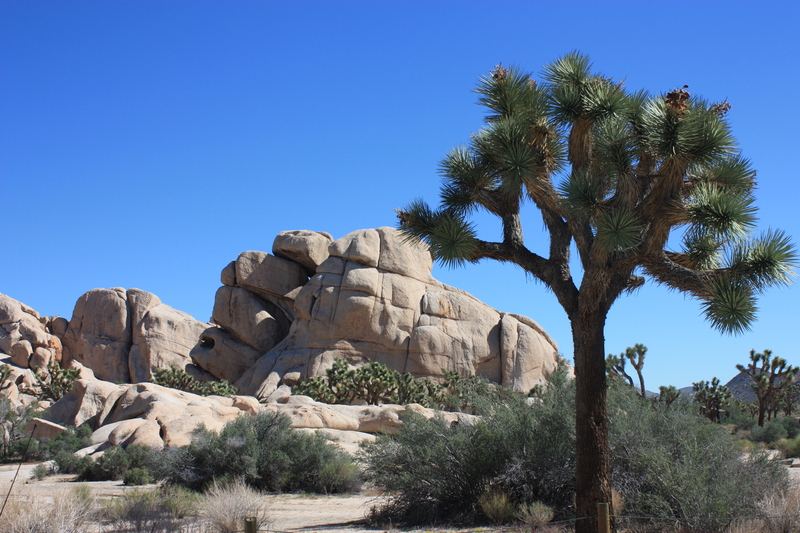 The Joshua Tree is like an alien hybrid of a yucca plant and a queen palm tree, and in Joshua Tree NP there were literally thousands of them…go figure! In the morning we got back on the road and by the middle of the afternoon it was time to say goodbye as I headed north towards Albuquerque, Sante Fe, Taos, and then on to Denver and they continued east into Texas and New Orleans before heading home to the Florida Keys. It was an amazing trip, my first ever long distance tour by motorcycle (but definitely won’t be my last), that covered 2,500 miles in 7 days. I didn’t want it to end! But I had to meet with the shipper to send off The Apollonia and The Chelsea to their new owners in New York, and I needed to get back to work and replenish my inventory for the Etsy shop I opened just before the hiatus! It’s been a long time since I basically vacationed for an entire month, and it was totally worth every 12 hour day I’ve spent working to catch up on things since returning home! Stay tuned in the coming days for some new posts revealing the latest projects. Curious as to what I’ve been up to? Let’s just say it seems I missed the memo on Independence day being in July, haha. As I have mentioned before, the creative process, for me, is very organic. 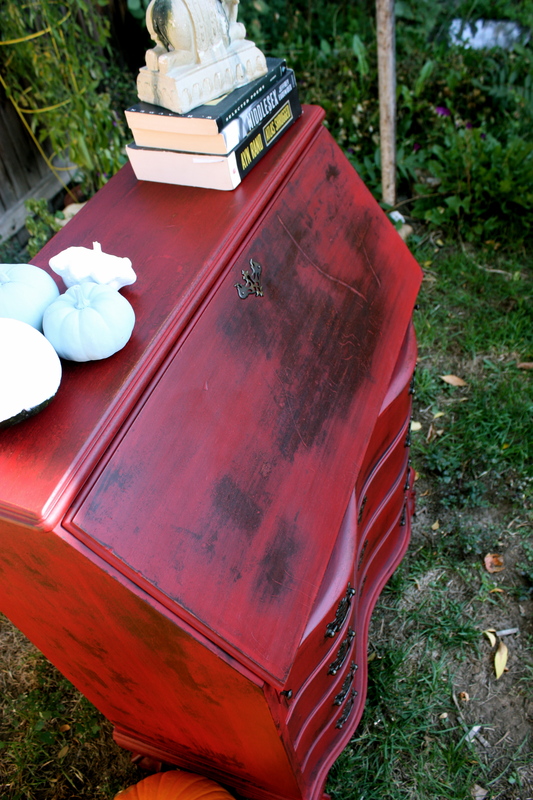 I can plan and plan and plan before I actually paint a piece…but as soon as I get my hands on the furniture and start focusing on it… cleaning it, sanding it, touching it…the furniture begins speaking to me and my plans are soon tossed out. 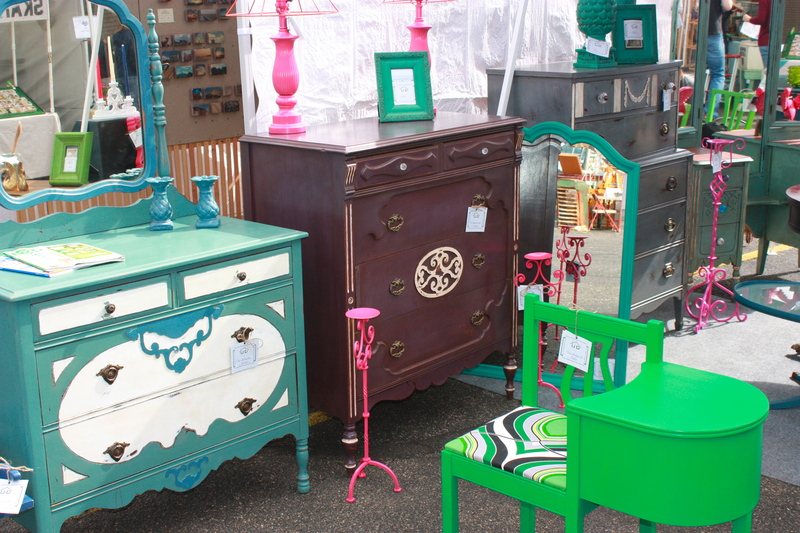 In short, I let the furniture tell me how it wants to “dress” so-to-speak. 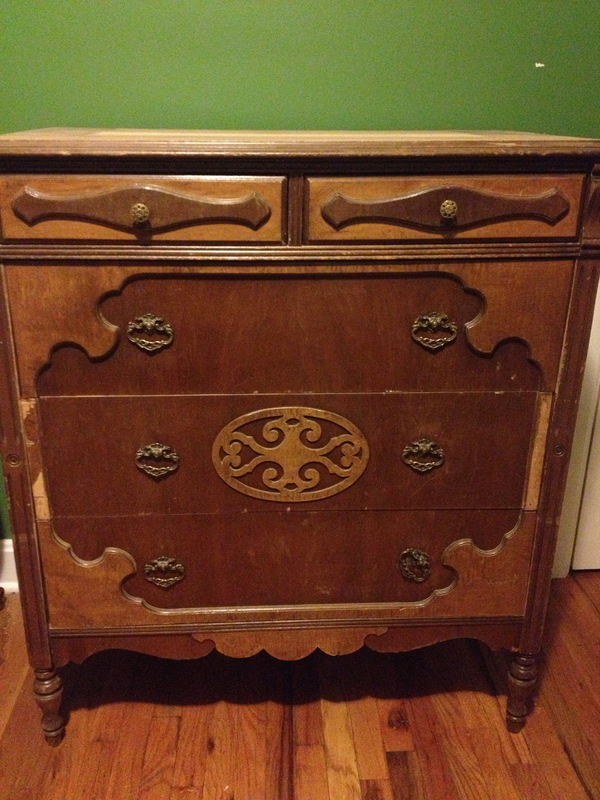 Before: In good, solid shape, but needed some work. 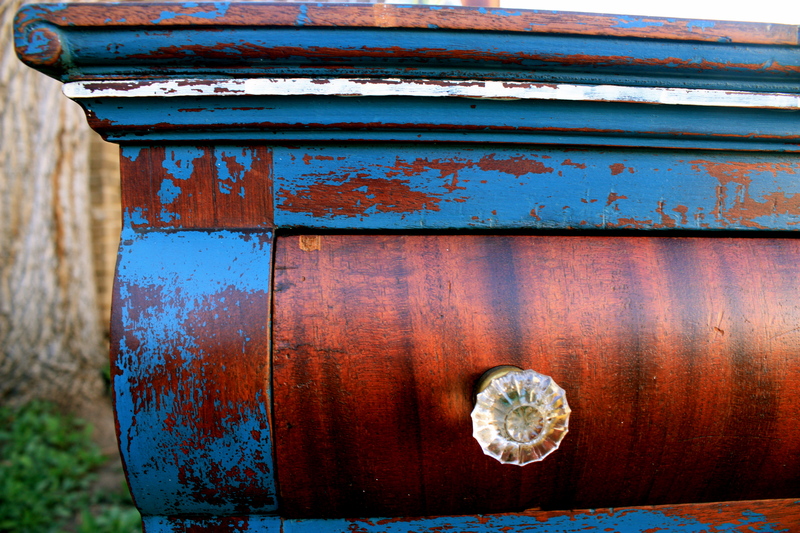 Don’t normally find such detailed mirrors on utilitarian, farmhouse dressers. …said she wanted to wear a classic and sophisticated gray. Why? 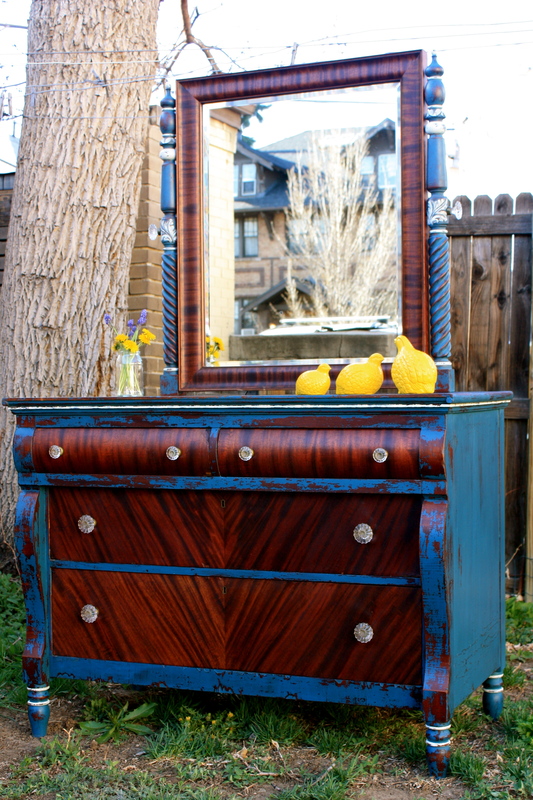 Well, The Hammond wanted to be painted in a neutral tone in order to let her stunning vanity mirror make the bold statement. 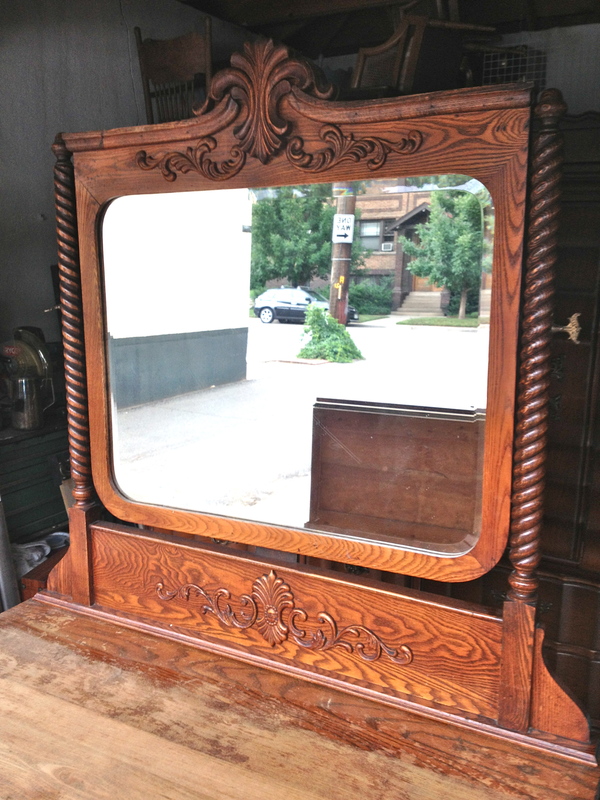 I mean, it’s not everyday I come across a century-old, utilitarian, farmhouse dresser with such an ornate vanity mirror. 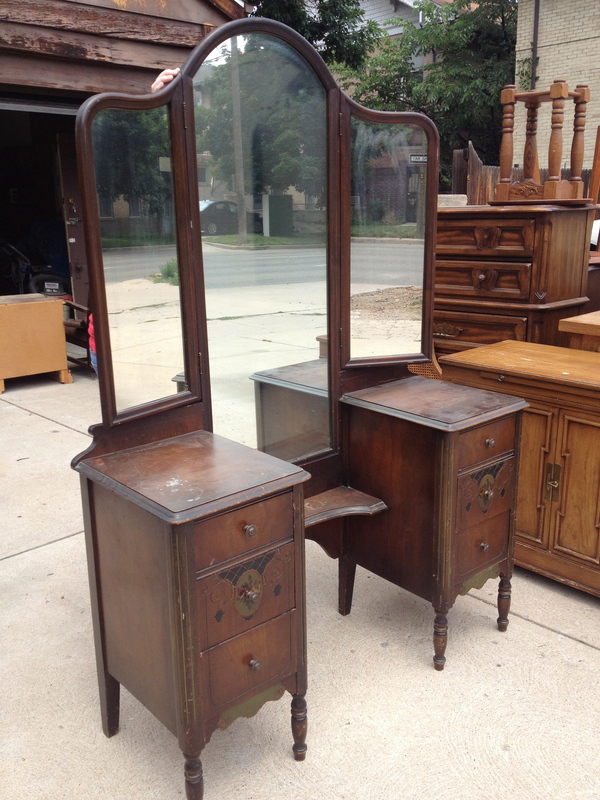 Usually, if I find the dresser and it still has the original vanity mirror, the mirror is just as utilitarian and undecorated as the dresser. So I was absolutely thrilled to find this lovely piece. And she wanted me to create a custom blended dark gray and to use a lighter gray to highlight her beautiful features. Perfect balance between chippy and distressing. On some pieces, neutrals still make a bold impression! 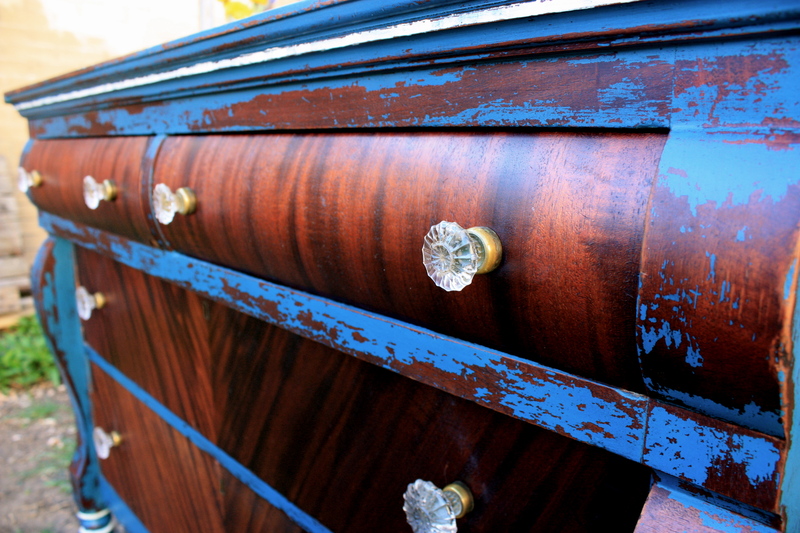 Don’t you just love the slatted sides on these old dressers? I know I do. 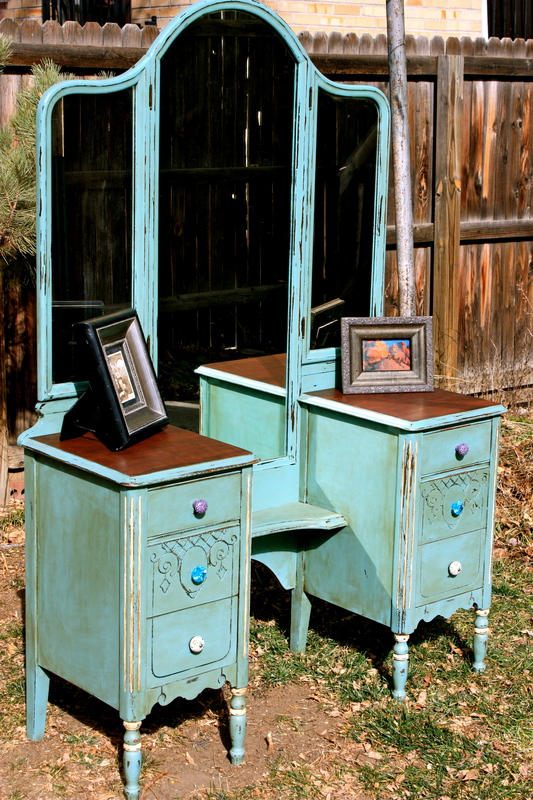 The scrolled posts and the rest of the vanity mirror were distressed using the wet rag method. For the appliques and raised detailing, I used a sanding sponge because I did want some of the wood to show through as well. Those details really pop! 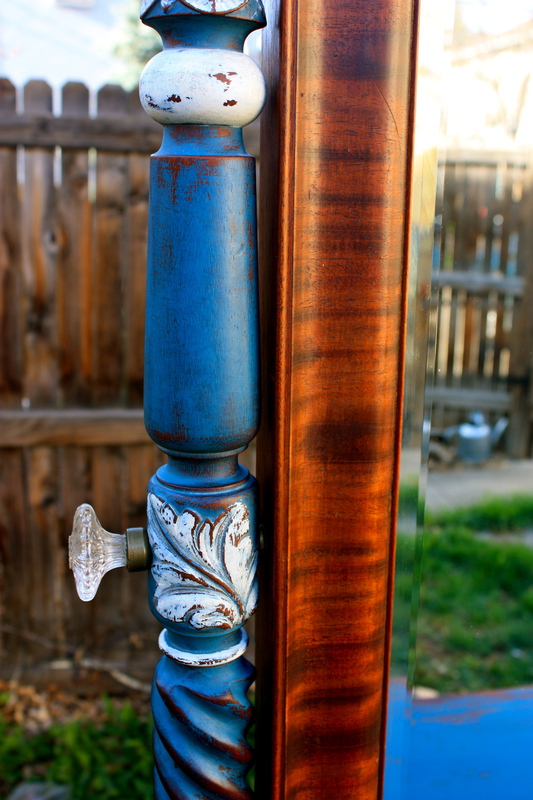 In addition to layering the paint and distressing back to the wood finish in some areas, I also used a heavy glazing application to really add depth and shadow to all of the little grooves and crevices. This effect really makes raised details stand out. 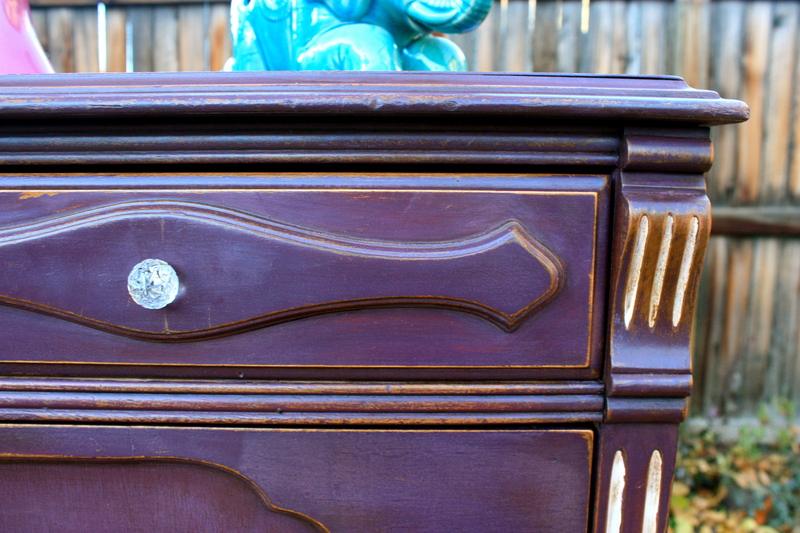 And lastly, the top of this dresser was pretty beat up when I bought it. But that’s okay…because I like the character it adds. Each piece has a story…and if you try and fix it up to the point where it looks “perfect,” then you effectively erase that story. The Hammond would never go for that…she loves showing off her herstory. In conclusion, I don’t always use bold, saturated colors. Every once in a while I dabble in the realm of neutrals. 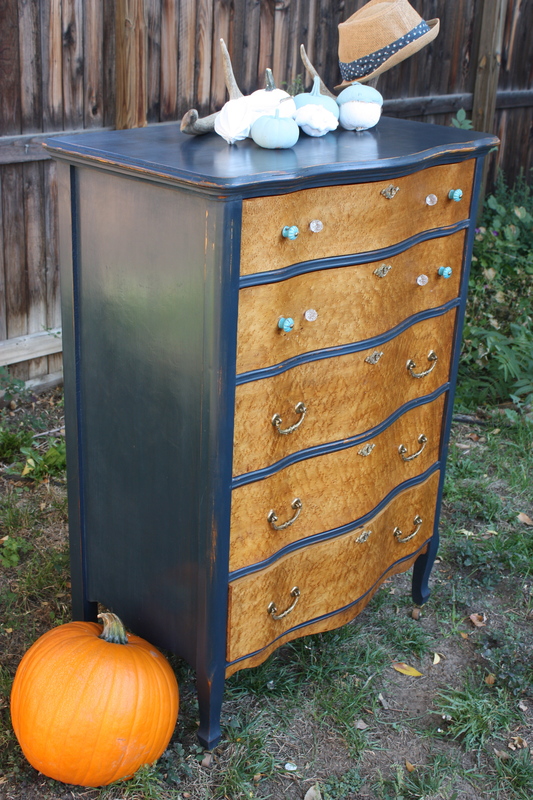 Never whites (though I never say never)…but gray is such a wonderful and versatile color (and popular color, as this dresser sold the day I posted it to craigslist). I know there are more than a few pieces currently waiting in The Hoard that are dying to ‘dress’ in gray. And I’ll gladly oblige them when their time comes.